Dreaming of how to pack Europe's top travel thrills and cultural treats into a two-week vacation? You've found it! Your Rick Steves guide will surround you with the art treasures of Paris, followed by a hearty taste of Burgundy, a hike in the majestic Swiss Alps, festive Munich, the romantic canals of Venice, Renaissance Florence, a countryside stay in Tuscany, the must-see sights of Rome — and chances to connect with Europeans like you never thought possible. Join us for the Best of Europe in 14 Days! Opportunity to celebrate Bastille Day in Paris! Opportunity to enjoy Munich Oktoberfest festivities! We'll have a group meeting at around 3 p.m. at our hotel in Paris, followed by an orientation walk through our neighborhood. Then we'll get acquainted over dinner together, and celebrate the start of our European adventure with a private panoramic bus tour through the City of Light. Sleep in Paris (2 nights). Bus 2 hours. Walking: light. Let's begin where Paris did, on the Ile de la Cité. 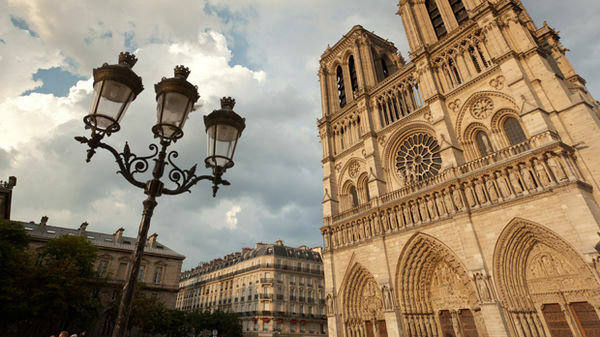 A guided walking tour will reveal the city's early history, including visits to a pair of the world's most important Gothic churches: the legendary Notre-Dame Cathedral and the exquisite Sainte-Chapelle. Then we'll take a stroll through the bohemian Latin Quarter. Next we'll explore Europe's greatest museum — the Louvre — where your guide will orient you and set you free to come face-to-face with the works of Raphael, Delacroix, and Leonardo, and timeless treasures that include Mona Lisa, Winged Victory, Venus de Milo, and hundreds more. The rest of the day is free to visit the world's greatest collection of Impressionist art — from Monet and Degas to Cézanne and Gauguin, and more — at the Orsay Museum, or be inspired by Monet's incredible Water Lilies at the Orangerie, or puzzle over the whimsical water fountains and modern art at the Pompidou. With your included Paris Museum Pass, the City of Light is yours to discover. No bus. Walking: moderate. This morning we'll hop aboard our bus and roll into the French countryside, passing pastures and vineyards en route to the "profoundly French" town of Beaune, in the heart of Burgundy. We'll take an orientation walk through Beaune, visit the Hôtel Dieu, the town's medieval hospital, and discover why Burgundy's wine is world-renowned as we enjoy a tasting together. You'll have ample free time to explore the many charms of village France and find dinner on your own. Sleep in Beaune (1 night). Bus: 4 hours. Walking: light. Today we'll leave the rolling hills of beautiful Burgundy, and climb high into the heart of the Swiss Alps. Our destination is the Berner Oberland's magnificent Lauterbrunnen Valley, flanked by towering, waterfall-laced cliffs and crowned by a trio of Switzerland's most formidable peaks: the Eiger, Mönch, and Jungfrau. Tonight we'll share a hearty Swiss dinner together at our creaky old chalet in the Lauterbrunnen Valley, where we'll sleep (2 nights). Bus: 5 hours. Walking: light. The day is all yours to enjoy some of Europe's most dramatic scenery. You may want to join your guide for an optional mountain excursion that combines the local narrow-gauge railway, a gondola lift, and a spectacular Alpine walk above the tree line, surrounded by a panorama of cut-glass peaks…or ride a gondola lift up to the Schilthorn at 10,000 feet, loiter in the thin air, and hike down…or for a more restful day, just wander through the valley and walk to the thundering Trümmelbach Falls: a unique set of waterfalls encased behind the valley walls. No bus. Walking: light to strenuous (your choice). Today's drive is a good time to catch up on your journal, listen to music, curl up with a good book, or just sit back and enjoy views of pristine mountains and sparkling lakes. We'll cross the border of Germany and stop at the Dachau Concentration Camp Memorial, where we'll learn powerful lessons of the Holocaust and World War II. Then it's a short drive to the heart of Bavaria — Munich. After some time to settle in, we'll take an orientation walk through Germany's most livable city, ending with a raucous beer-hall dinner where you can hoist a liter-size mug of beer and a pretzel as big as your head. Sleep in Munich (2 nights). Bus: 7 hours. Walking: light. This morning we'll meet our local guide and explore Munich on a walking tour. From its medieval roots, to its turbulent role in the first half of the 20th century and amazing post-war recovery, you'll gain an appreciation for the small-town feel of this city, dubbed "Millionendorf" — the village of a million people. Your afternoon and evening are free: you can rent a bike to explore the sprawling English Garden, be dazzled by the Deutsches Museum, or poke around Marienplatz and the Viktualienmarkt looking for the cuckoo clock of your dreams. No bus. Walking: moderate. We'll take a scenic, all-day drive to Venice today, stopping en route for lunch together in a characteristic Italian-Tirolean village. At the edge of Venice we'll board a vaporetto boat for an "am-I-really-here?" Grand Canal ride to our hotel in the historic heart of this seductive city. Tonight we'll take an alleys-and-canals orientation stroll to St. Mark's Square and enjoy dinner together. Later, your guide will organize an optional gondola ride for this romantic, uniquely Venetian experience. If the moon is out, it will hit your eye like a big pizza pie. Sleep in Venice (2 nights). Boat: ½ hour. Bus: 8 hours. Walking: light. This morning our local guide will take us on a winding walking tour through Venice, blending historic and modern-day stories of this one-of-a-kind treasure, and giving us a local's perspective on Venice's fascinating past…and its uncertain future. We'll finish our morning walk in St. Mark's Square and Basilica. The rest of your day is free to visit the Doge's Palace, or the Titian- and Tintoretto-packed Accademia art gallery. Better yet, get lost (remember, it's an island) exploring the alleys, cruising the canals, and "crawling" the pubs. No bus (too much water). Walking: moderate. Today we say "ciao Venezia" as we hop back aboard our bus and drive south into Tuscany. We'll wind our way through the verdant Tuscan hills to our destination: a working family farm that also serves as our country hotel. You'll have free time this afternoon to take a scenic stroll amid the peaceful vines and olive groves, relax by the pool, or taste some of our host's family-made wines. Before we sit down to a hearty country-style dinner together, we'll see how it's made, as our chef gives us a special Tuscan cooking lesson. Sleep peacefully near Florence in Tuscany (2 nights). Boat: ½ hour. Bus: 4 hours. Walking: light. We'll drive to Florence this morning, and hit the ground walking with a Renaissance tour of the city's historic center — learning how Brunelleschi's cathedral dome and Ghiberti's Baptistery doors helped define this world-changing era. We'll end our walk at the Uffizi Gallery, home to masterpieces by Leonardo, Botticelli, Michelangelo, and more. After some free time for lunch, we'll regroup for a visit to the Accademia Gallery, where we'll marvel at works of sculptural genius: Michelangelo's rough-hewn Prisoners and his greatest masterpiece, David. We'll return to the countryside late this afternoon with plenty of time to relax and freshen up before dinner together. Bus: 2 hours. Walking: strenuous. This morning we'll drive straight to the heart of Rome. After a quick lunch and transportation lesson, we'll focus on Renaissance (Catholic) Rome at the sprawling Vatican Museums. We'll visit what seems like a limitless collection of treasures as you make your way to one of the world's most famous works of art: Michelangelo's Sistine Chapel. We'll then introduce you to the greatest church in Christendom, the awe-inspiring St. Peter's Basilica, home to Michelangelo's sublime Pietà. Tonight we'll celebrate la dolce vita Roman-style, with an after-dinner stroll through the floodlit heart of the city, lacing together the lively campos, classy piazzas, and the splashy Trevi Fountain. Sleep in Rome (2 nights). Bus: 4 hours. Walking: strenuous. Today we'll travel back in time as a local guide takes us through the monumental Colosseum and the birthplace of Ancient Rome: the Forum. We’ll continue our history lesson at the awe-inspiring Pantheon. Then, you'll have the rest of your day free to explore more of the Eternal City on your own (don't forget to taste some refreshing gelato along the way). This evening we'll have our final dinner together, sharing memories and toasting our newly made friends. No bus. Walking: strenuous. The experience was excellent. I was uncertain if I would enjoy the tour dynamics and the group travel experience. I am happy to say I found the tour was very enjoyable and the group environment enhanced on many levels my enjoyment. "I had many wow moments. Switzerland for sure but for me it was our morning in the Forum. The guide was outstanding." Jennifer did a wonderful job keeping us all engaged and informed. The guide (Patrick) in Munich was very good. Francessa in Rome was the very best guide I have ever had.Made me want to go back to school to see if I could be as interesting as she is. "Both days with Francessa in Rome"
This was my second tour and was just a good as my the first. I got to spend time with my step daughter and met some lovely folks. I would go again in a minute. 14 days was just about right....21 might have been a bit too much. Our schedule was full. Our tour guide was great. She was informative, helpful and available. Her assistant complimented her in a lot of ways but especially in the small things that made her job and our experience much more enjoyable. "The WOW moment was the walk on the 'walk of Fear? in Switzerland and Switzerland experience overall. Loved the little town, the food, the hotel and the amazing scenery. I was so nice to be away from the crowds!" Great trip! I was exhausted at the end of every day but always ready for more the next. "Being from Colorado, I love the mountains. Drinking hot chocolate on top of the Shilthorn blew me away! I had been to Rome before but had never experienced it like I did with Francesca." Tour was everything we expected and more. Great group of people. Jennifer and Philipos were wonderful tour leaders. We felt like we got the "inside scoop" on the best things to see and how to see them. "Being at the Roman Forum just as it opened on a glorious October morning. We were the first and almost only group in. It felt like we had the place to ourselves and then our local guide Francesca gave us an amazing tour of the forum. We felt like VIPs"
My husband and I had never traveled to Europe prior to this trip, and we thoroughly enjoyed the entire trip. Each of the areas we visited during our "Best of Europe in 14 Days Tour" was interesting and fun in its own way. We appreciated learning about the amazing history of the various European cities, and we also appreciated the free time we had to explore on our own. It didn't take long before we felt comfortable with the transit system. "We loved the beauty of the Swiss Alps. The Lauterbrunnen Valley in Switzerland was spectacular. We also found the tour of the Forum in Rome incredible and fascinating." The tour was a wonderful experience for me over all. This was my first time to Europe and I could not have asked for a better experience than I got with this tour. Our guides Jennifer and Philipos did an outstanding job of leading activities, getting tickets, organizing the troops, and making sure we were all thoroughly enjoying ourselves at all time! "Our guides arranged to get into the Roman forum early in the morning and we were the first ones there. The weather was perfect that October morning and just being there with the group as the only ones in the whole area for a time was extra special." This trip was my first european trip ever and with RS. I chose it bc it highlighted the things I had dreamed of seeing. My family is european and now I've seen it! A great exposure to so many wonderful and varied sites, well informed and prepped by our guides and awesome driver. I only have great memories to recall as even the weather was amazing. As I also was travelling alone for the first time, it was wonderful to have hooked up with other friendly travellers. "My first WOW was driving up to the Arc de Triomphe in Paris. But every city gave me moments..Favourite has to be Saint Chapelle..from the first glimpse inside, I felt the heavens explode! A gondola drop off the Swiss Alps and a gondola ride in Venice singing Volare..Tuscany, so much beauty all around! And Rome...how incredible the Forum and ancient ruins of the Colosseum." I am a frequent traveler and was hesitant to book a group tour because I didn't want to "drag a group around" everywhere we went. I was pleasantly surprised at how little this trip felt that way. The tour guides were great, and I mean great, at keeping everyone on track and timeline. Can't speak highly enough of Jennifer and Filippos. "Lauterbrunnen valley in Switzerland. I have an fascination with beautiful mountains and that valley was great." Great travel experience. It met all of my expectations!! "When I arrived in Paris at our hotel." loved the locations[INVALID]-transportation was very comfortable; stops nice; Tour guide knowledgable,entertaining,just fun to be with! "First time to Switzerland---amazing scenery,air, ambience---so enjoyed experiencing Launterbrunnen, the gondolas, the hike---all of it! Venice was also another wow! Amazed at the number of bridges and stairs---fortunately Tina warned us!" This was our second Rick Steves tour and it certainly did not disappoint. It brought together the biggest highlights of Europe - just an amazing experience! I can't say enough good things. Everything from the historical sites to Tina our amazing guide, the local guides, food, etc was just incredible! Would highly recommend! We love these tours so much that we already have our 2019 tour booked and preliminary plans for 2020. "Swiss Alps without a doubt - the scenery is just breathtaking and so peaceful. We easily could have spent weeks there and never tired of it. Secondly, our local Rome guide - Francesca, was just amazing! She brought the history, art, and architecture to life in a way I didn't think possible. It truly made us feel part of history and appreciate things even more! I would highly recommend/encourage the continuation of the Capitoline museum as part of the tour with Francesca." Overall, really good. Tiring, but we certainly expected that for this type of active "best of" multiple countries trip. Great sights, great art. Well-structured, great variety. Food and wine good, but short of excellent. (See below.) A really nice group, no "bad eggs" whatsoever. I'd be happy to host any of them in my house. Would be happy to host Tina in my house if she ever travels to Wisconsin! Definitely met my expectations. "Swiss Alps. Roman pantheon. David. Eiffel Tower views. Octoberfest." It was the trip of a life time for me. It was our 30th anniversary and Tina made it spectacular! We have never traveled to Europe and we were a little nervous about booking things ourselves. We had an amazing trip!!! I would definitely recommend anyone to book a Rick Steve's trip and if you get Tina for your guide you are going to love it! "It is hard to say because every place we went was kind of a WOW moment for us the entire trip! I keep thinking back on our trip and it all seems like a dream it was that spectacular." First time taking Rick Steves tour. Tour write up accurately described what we were going to do on the trip and the expectations of us. Loved the structured approach of the tour. A very busy agenda but that was expected. "Each stop offer at lease one: Paris - Eiffel Tower, Munich - Oktoberfest, Rome Colosseum, Switzerland - Alps, Florence - David, Venice - Whole city. Plus all the museums each city had to offer." It was as good as I envisioned. Hitting every major tourist spot in 14 days is no joke - constant "wow, I can't believe I am here" moments. Tour guides were wonderful, food was wonderful, the variety of cultures and busy / calm days was wonderful, bus and driver were wonderful. No complaints at all. "I think the biggest wow moment for me was viewing the Roman forum for the first time, as we walked up the stairs and peered out the museum. That, mixed with what Francesca explained so elegantly to us, kind of blew me away. Imagining the Romans building massive buildings all around, full of bronze and marble statues, with the Colosseum in the background... it was one of the most profound sights and feelings I've ever experienced. I'll never forget it." This response will serve for myself and wife, Mary Jo, who was sent a separate evaluation. Everything about this tour was first rate. Your city guides were great, the accommodations were charming and a reflection of the culture of each city. The coach was awesome...and our driver, Eric, is a fabulous person and skilled driver. Most of all, Tina is an outstanding tour guide and she is a tremendous asset to your company. Without Tina, the trip would have been much more ordinary. "My wife and I loved Switzerland. What a beautiful country. Our wow moment was the Vatican...although there were so many other wow moments...especially for myself as this was the first trip I have taken to Europe." This was our third Rick Steves tour, and just like the other two, it did not disappoint. We had a great guide and a very nice group of tour companions. The tour was well organized, ran smoothly and offered a wonderful taste of 4 different countries. "The scenery in the Swiss Alps was spectacular. Definitely a wow moment when the fog/low clouds broke, revealing the Jungfrau and other peaks. Other places offered special moments as well. The Eiffel Tower at night, the charming town of Beaume, France, the gondola ride in Venice - to name a few. And nothing is quite like Oktoberfest." We had a great time. The pace was perfect and we thoroughly enjoyed every moment. It was great having everything planned out for us but we also loved having our own free time to explore. We have recommended this tour to many friends! "We had many wow moments. Switzerland was amazing. Our hike in the alps was in the morning fog and then a couple hours later it cleared and it was breath taking!" Overall it was a very nice experience for my first tour sponsored vacation trip. I knew it would be a fast and furious trip in order to see all the cities and/or locations. Our tour guide (Ben) and apprentice (Gabriella) were very informative, helpful, and entertaining. Being as tall as Ben I did miss a bed for my size. I do miss the American equipped hotel rooms. That being rooms with a frig (for our wine, cheese, etc) and an iron. Also a wash cloth in the bathrooms would we nice. "Several sites were wow moments. Paris at night, castle in Beaune, alps, Octoberfest, Venice in general, historic buildings in Florence, Colosseum, lasagne sites and St. Peter's in Rome." I enjoyed every aspect of the tour and felt very well taken care of. There was a good balance of information and fun, group time and alone time, and sit down meals versus buffet-style service. Our guide went out of his way to make sure the group got acquainted with one another, and that was helpful for me as I was traveling alone. On the bus ride, we had lots of restroom breaks, so I never felt any anxiety over that. Very well planned and executed. "There were many times that I said "Oh, wow." Oh those, I think looking out the window of the chalet dining room at night and seeing the waterfall cascading off the mountain-side was the most impressive sight. They light up the falls so that you can see the movement in the water even though it's pretty far away. Really stunning. Also rounding the corner and seeing the clock tower in the Marienplatz square in Munich took me by surprise. It was so big and ornate-like a giant cookoo clock." I wasn't sure what to expect on taking the tour for the first time. The whole trip was outstanding. Our guide Dave was very thorough, patient and had the best advice for everything we did either with the group or on our own. We had experiences with the group that we would never have had an opportunity to see. There was a lot of free time to explore on your own. Every place we stayed was quiet, quaint and had a lot of character. I had the best time and recommend the tour highly. "I really enjoyed the private concert we had at the church in Switzerland. What a privilege to be able to hear the local songs and instruments." It was AMAZING. From the great group of people we toured with and shared great memories with, to our wonderful tour guide Dave, to all of the awesome people we met along the way, it was an incredible experience from top to bottom. It seemed like every day just got better and better. Our local tour guides were incredible and added so much to the experience. It was truly a once-in-a-lifetime trip and we're so glad we spent it with Rick Steves Tours and this wonderful group of people. "Oh, this is difficult. Every time I think about one moment that might be my favorite, I remember several more. Drinking wine with a Count in his Castle in Rully...the Alps...the private concert in Lauterbrunnen...the agriturismo near Florence...riding a gondola at night in Venice...the history in Rome...it was all just incredible. If I had to pick one moment, the concert in Lauterbrunnen stands out. Listening to traditional Swiss music in an old church, and they let us (try to) play the Alphorn!" The tour was a "taste of Europe" which left us eager to see more deeply into each region we visited. Every aspect of the experience was wonderful. The slower pace at the beginning prepared us for the more strenous touring ahead.The chosen sites were a great beginning to the other sites we wanted to explore. The accomodations were always something to discover and the group meals were nicely presented and full of flavor. We never heard a discouraging word amongst our fellow travelers. "There were many!! Switzerland was an unexpected surprise. From the scenery to the accomodations to watching the paragliders...the walk through the countryside, the fresh air and the sunshine. The strobe lights on the Eiffel tower brought out ohs and awes from all of us. The gondola ride, watching the mask maker's demo, and discovering Rome's historical history brought to life.Touring the castle in Burgandy...very moving." This was an amazing trip! I really had no idea what to expect from a Rick Steves Tour, having never been on a tour before I didn't know what to expect. this was beyond anything I could have imagined! So many great sites and fun outings! I especially enjoyed all the impromptu side events that Dave took us on - gondola rides in Venice, gelato, hiking in the Swiss Alps, laundry in Germany, and so on! "Favorite WOW moment had to be the Swiss Alps and the gondola ride to the top of Schilthorn Mountain. I have never seen a more spectacular place! Dave was a great guide! Taking us on a mountain hike and guiding us through all the transportation steps." Once in a lifetime adventure which was enhanced by our TERRIFIC guide Dave. My sister and I have been talking about this trip for 5 years and we were not let down. The people that were in my group were all fantastic and easy to spend 2 weeks with. "The Villa outside of Florence. It was beautiful and a definite asset to this tour. If I go back to Italy this is where you will find me walking around the grounds." This was my first tour to continental Europe and I was very impressed with the introduction and exposure to so many different experiences and countries. The tour was very well organized for optimum experience. It was quite physically challenging at times but that is to be expected in order to gain the maximum experience available. "I think my "wow" moment was the tour to the Colosseum in Rome. I was in awe with what our predecessors did over 2000 years ago. My second "wow" moment was the food and chef in Tuscany. That woman can cook!!!" We saw a lot of interesting things that I might not have seen on my own. There was so much packed into such a short time that I needed "down time" when I got home, just to digest it all. We stayed a few days in Paris prior and a few days in Rome afterwards and it was really helpful in order to fully enjoy the main event. The group we traveled with was great and Dave was very good at involving everyone. We bonded quickly and I think that is important. "My "most" wow moment was unexpected. It was seeing Dachau concentration camp. It is very important to see and absorb it, but it's also incredibly moving and upsetting. My favorite moment was walking in the Alps. coming back from seeing the top of the mountain was so pleasant with the warm sun and the cow bells. It was very calming and I wish it could have been after Dachau, as the reflection time would have been nice, but Venice isn't that direction. :)"
This tour exceeded all my expections and was planned perfectly. Our tour guide Cary is gifted at her job and it was clear that she enjoys it immensely. She has taken her previous experience as a teacher to a new level. She reads people well and truly delights in making her clients happy by meeting individual needs. Cary fostered a tour "family" experience and we are blesssed to have been part of it. Fantastic experience! "Difficult to put one moment as a "wow" moment but it was the diversity of the trip... going from the cultural, city atmosphere of Paris, to the magestic, quaint, peaceful atmosphere of the tiny towns in the Swiss Alps, then on to the lively Octoberfest antics of Germany, and to the timeless beauty of Venice, Tuscany, and Rome. I had many "Wow" moments that will be unforgettable!" I had a great time. Activity level was just right. Our guides were phenomenal. I'd like to tour with them again. "There are so many to choose from. Seeing the David was one of those moments. Another was when we turned the corner into the grand canal on our Venice gondola ride and saw a full moon. I think Cary set the ride up for our group." Cary and Marie did a spectacular job with the tour. The kept us motivated, informed and gave the tour group the flexibility to experience locations on our own. When I recount all the places we visited, it makes my head spin a little, but it was well worth the pace we took to visit the locations, art and enjoy the local cuisine. This tour gave us the opportunity to be guided through the cities we visited, and will give us the knowledge to come back and vacation in cities at a slower pace. "Since it was my first visit, everything was a wow moment. The Lauterbrunnen valley was quite spectacular, the art and history of Munich, Paris and all of Italy was amazing. Dachau and the American cemetery in Italy was heart wrenching and humbling. The food and wine everywhere we stopped was incredible. The whole tour was a wow moment." This has been the vacation of our lifetime! Thank you to Cary for making EVERYTHING PERFECT, even the weather. Her ability to maintain order under stressful moments keeping a calmness among the group.and never showing stress in yourself is rather impressive. "Her timing of those "wow" moments have been incredible! Eiffel Tower lights Cows in Lauterbrunnen Full moon in Venice during the gondola ride Music in St. Mark Square Just to name a few." I was excited and a little scared being that this was my first trip to Europe and as a solo female traveler. The latter feeling was squashed the first night meeting Cary and the rest of the travelers. Cary set the stage and atmosphere to be more like a family working towards a great vacation for everyone. Cary and Marie were professional and personable.Marie was a great support and foodie who knew where to eat. "There were so many "wow" moments its hard to pick one. I can say that the facts and storytelling behind every stop/destination makes it more memorable." Overall the tour was perfect! There were a couple (1 or 2) pretty long bus days that is might have been nice to break up or subsititute with a train ride. A very busy tour with some amazing sites. So much history and fun cultures of the different countries to learn about. "For some reason, once inside the Notre Dame Cathedral it took my breath away!" We were celebrating our 25th wedding anniversary with this trip! What a great gift to ourselves. The two "Ps"....Places we saw and People we met made this the trip of a lifetime! "Switzerland - definitely Switzerland! Such a beautiful contrast to anything we've ever experienced! Although the wine-tasting in the medieval castle near Beaune has to be a particular highlight and a huge surprise!!" We had a great group of travelers. Traveling as a solo, I was a little worried I might find myself with too much alone time, but that wasn't the case at all. The tour was very fast paced and trying to learn the basics of 3 different languages made it a challenge. Jennifer did a great job encouraging us to expand our horizons. I feel like I could go back to any of these countries and navigate their public transportation system. "Going back to the hotel late at night in Paris using the Metro. The machine wouldn't take my cards and there wasn't an attendant. The smallest money I had on me was a 10euro. Of course the machine wouldn't take that. So I had to ask passerbys for change. There weren't many people that late at night. Finally a young gentleman stopped and listened to my plight. I told him I'd give him the change if he would use his card to get me a ticket. He did & then pointed me in the right direction." Cindy and I were very satisfied with our tour. The mix of free time and structured tours was just the right balance. We appreciated the information our guide , Jennifer, gave us prior to arriving at each location. Also much appreciated was the practical tips for getting around either by bus or rail. The hotels were good as each had its own character. "The overall "wow" moment was our experience in the Swiss Alps. Top of the Shilthorn." I received so much more from this tour than was expected! The extra lessons about each country and its culture, food, and history were a huge plus to the actual places we visited. We took care to pack light [INVALID] and we were glad we did. Jennifer, our guide, was fantastic! The other people on our tour group were also adventurers and enjoyed learning everywhere we went. This trip made us travelers [INVALID] not just tourists. I believe a torch has been lit! "My personal "wow" moment was seeing the Eiffel Tower all lit up with thousands of flashing lights! Just breathtaking. However, really tough to pick just one moment!" The tour and guide were well organized. The hotels were great and well located. The bus driver and the bus rides were enjoyable. I saw all the sights that were important to me with the exception of the Louvre...too crowded at the time of our visit. A time later in the day closer to closing time would have been better. "The view from the Capitolini museum of the Forum in the afternoon with the sky glowing after a thunder/rain storm. Also, seeing the Mona Lisa as my name is Mona Lisa. I have wanted to see her in person my whole life. It was actually pretty emotional." This tour was an amazing mixture of art, history, architecture and natural splendors made even better via a wonderful guide (Dave), a great bus driver (Paul) and fantastic local guides. "There were SO many "wow" moments ... including the Eiffel Tower's delightful sparkling display on the hour at night, the awe inspiring alpine views hiking near Murren, the power and intensity of the Trümmelbach Falls in Lauterbrunnen, the exquisite wonder experienced while viewing Michelangelo's David in person, and the mixture of emotions standing within Rome's 2,000 year old Colosseum." We feel we had an amazing experience. The trip far exceeded our expectations and all the guides were friendly and informative. Initially were a little concerned about the 2 long travel days and having to spend long hours on the bus but we were pleasantly surprised at how much we enjoyed each travel day. The time on the bus went by fast we feel because the travel days were so well planned and executed. "Every day brought a new wow factor. This tour brought out so many great experiences its hard to single one out as the best. The whole trip was a "wow" for us." The tour guide was great! The bus driver was great! Shout out to Paul! The people on the tour were great! The hotel and restaurant people were great! The surprises were great! The places we went were great! It was the kind of vacation that you wish wouldn't end. It also made you want to come back, and you know you can because you learned how to navigate, communicate and enjoy the lifestyle. "While at the Capitoline Museum, a thunderstorm broke out. It stopped raining just before we went to the area overlooking the ruins of the Roman forum. When we got outside to view the ruins, they were bathed in this other-worldly light. The only word I can use to describe it is surreal." We had a wonderful time with great food and savvy local guides. "Seeing the coliseum ruins from the window of a museum following a rain storm when the sun had just come out. It absolutely looked like CGI." The tour was wonderful! It far exceeded our expectations for our first trip to Europe. Our guide Dave was great, very knowledgeable and always willing to answer any questions we had. We enjoyed the local guides in Paris, Munich, Florence and Rome. Each provided a wealth of information and history. The attractions we visited were all interesting. It was a great group of people to share our experiences with! "I had several "wow" moments - the cathedrals in Paris, Munich, Florence and Rome, a stop for pizza in the quaint town of Egna, Italy, hiking in Switzerland and entertainment by local musicians, the view, accommodations, food and entertainment in Tuscany,and the gondola ride in Venice. It was l4 days of pleasant surprises and enjoyment!" very, very, very disappointed.... that we did not do such a tour earlier in our lives ! The tour deserves 5 E's - Exceptional, - Entertaining, - Enlightening , - Educational, - Effective. "Realizing the existence of such history, age and human endeavors." This was our first trip to Europe. Our expectations were met and exceeded. We would describe the tour as perfect. We are so happy to have picked this tour and this particular date. "I would say Lauterbrunnen was my "wow" moment along with Rome." It was an amazing experience. Dave was definitely up for the tour,explaining everything we needed to know and more. Every day was a surprise and we saw and experienced things I never imagined. Every local guide was fabulous, going way beyond just being a tour guide. I would recommend this tour, especially to people who have never traveled to Europe. "Probably the ruins in Rome. We first saw them from an outside deck in a museum. It had just rained and the sky was perfect. It looked unreal, like a dream. Francesca made that much more of an amazing experience." This was our first Rick Steves tour and our first organized tour of any kind. We have always gone out on our own and been very confident in doing so. We were however a bit reluctant to tackle Europe on our own. We were very pleased with the way David oversaw our tour experience, with the great group of people on the tour and with the local guides that joined us throughout the trip. The whole tour was very well organized and provided a great value for the money we invested in it. "There were two. First was our time in the Lauterbrunnen Valley in Switzerland. The valley floor, the waterfalls, the Eiger, the hiking, the hotel and food - all created a tremendous "wow" moment. The second was our tour with our incredible local guide, Francesca, at the Capitoline Museum in Rome. She is a gifted teacher who brought history and the art in the museum alive for us. And then when we walked up yet another flight of stairs to find the Roman forum displayed before us, "wow!"" This was a fabulous, once in a life time tour for me.I was nervous, being the only one in charge of my daughter and me in places where we don't speak the language. We met a "guardian angel" in Wisconsin who was raised in Paris. She helped us catch a bus and walked us the extra 3 blocks to the door of our hotel. From then on the rest of the tour was comfortable and very fun.We got to see all of the major things in all of the cities we went to, all taken care of, and didn't have to wait in lines. "My first "WOW" moment was arriving in Switzerland. Everything was breathtaking, more than I could have imagined. However, after running hard for nearly two weeks and thinking that I had seen everything I needed to see, we arrived in Rome...even my 18 year old daughter was suddenly invigorated and excited to see more. Francesca, our local guide made us envision everything how it was in the past.Suddenly history was interesting! I cannot believe I walked where Caesar walked. We want to go back." Incredible experience! Colleen our guide truly made it a trip of a lifetime. Thought the pace was good, great tour stops and local guides, liked the orientation walks. Like doing group tour in the morning and having the afternoon and evening free. Highly appreciative of the amount of bathroom breaks. Spent just enough time in each place. "Our local Rome tour guide making ancient Rome come alive in the Capitoline museum! The group was hanging on her every word, and learned a ton about ancient Rome as well as museums in general." This tour far exceeded my expectations! I was concerned about my stamina for an active tour, but it was paced well enough for me to keep up. I loved all the experiences we had! We were well informed by our guide before we arrived at a destination of what to expect and what we would be doing. The information was well paced too. "There were so many! I was surprised by how much I enjoyed Paris! Our guide helped us understand their culture and we found the people to be delightful! The museums, monuments, markets, and restaurants were wonderful, along with the entire city. We would love to go back! Riding the metro was a new experience for us and Colleen prepared us before we got there and it was fun instead of scary." It was great. First time to Europe for me. I wanted to see and do it ALL! We were very lucky to have Colleen as our guide. Really enjoyed her spending time with her and her years of experience hosting trips. The trip delivers the balance of enough organized dinners and event to get to know your fellow travelers and enough time to do some things on your own. "It is really hard to narrow this down. The Gondola ride in Venice was a nice add on that Collen coordinated. I also enjoyed the hike in Switzerland." First of all, I must thank you Rick Steves for starting such a wonderful travel company where a person can experience "authentic" Europe. Your philosophy about travel is what makes your company unique and your tour guides embody this. My husband I went on a My Way Tour 6 years ago and we loved it so much we wanted to do it again but this time with the complete tour. They both are a fabulous way to experience Europe, but when all is said and done, I feel that the complete tour is my favorite. "Since we had traveled to the exact same places we had before, I didn't really have a "pinch me, is it real" moment like last time. The whole trip was fabulous! When Francesca, our guide in Rome spoke so poetically about Rome and what a museum should be, it was emotional for me. When I saw the Roman Forum from the window at the Capitoline, it made me tear up realizing everything she had said was so true. So "Wow" It was amazing." This was the trip of a lifetime. We enjoyed every moment and learned so much about how to travel in a foreign country, what to do, how to pay, how to speak, how to get around in a city by subway, train, bus and taxi, how to eat in restaurants, all about the culture and history of each major stopping point. I have regaled our friends with our experience and they all want to go on a tour now. It was fabulous and our guide, Colleen was the best ever. Every day was wonderful in its own way. "I think my "wow" moment was when I realized that I could get around the city just like someone who lived there. That it wasn't that hard, it was understandable, and it was fun. It opened up whole new doors to go places and do things that we originally were reluctant to do. And I loved all the walking. I had no idea that European cities were so walkable and safe. That was a real eye opener." My overall goal for joining this tour was to get a primer on traveling in Europe. I wanted all of the transportation, hotel reservations and itinerary to be taken care of so that my husband and I, novice international travelers, could enjoy the highlights of Europe. The tour met and exceeded my expectations! Our time was well planned and allowed us to visit many of the classic sights in the cities and countries we visited. Just wonderful! "My "wow" moment was when we were visiting the Capitoline museum in Rome. We stepped through an arch onto a covered balcony that overlooked the Forum. Our guide, Francesca, said before we entered the arch that we were about to step into a painting. The moment I saw the Forum from that viewpoint I was spellbound. I will never forget it!" I was very impressed with the quality and professionalism of the tour. While the schedule was very full most of the time there always seem to be personal time to regroup or rest if needed! I loved the diversity of city time interspersed with country quiet. Overall it was exactly what made this tour special! "It is difficult to pick one "wow" moment. I would say it would have to be the architecture. While we have learned and seen these ancient structures in books and other medias it can only be truly believed seeing them in person. The marvel of design and construction without modern technology is very impressive." The tour was good as expected. It's a very busy tour. The group dinners were fun. I think everyone got along pretty well. "Lauterbrunnen Valley was beautiful as was the small town of Grindelwald. Which was my favorite town, small, quiet, peaceful where you could hear the goat bells, the waterfalls and no tourists! We stopped in the Italian Alps for lunch and also another small town with a very cool castle." The overall experience was amazing. We couldn't of asked for more. "The whole tour was a "wow" moment." The trip was wonderful. It was everything that I had hoped for. It was my first trip to Europe and I felt that I got to experience everything I could have in 14 days. "Every county and city that that we went to. I keep thinking that nothing could top what I was seeing, but everyday brought something else just as "wow"." Really was great. A little intense at times putting so much in such a short amount of time. The group was good everyone got along and were mostly very interesting. Thought we could have done without the music on the bus but I think Jennifer was just trying to set the mood when approaching various locations. Loved the little side stops in the non tourist towns really kind of highlights. "I say the Alps were the most impressive thing we experienced. Just so beautiful." This was absolutely the best travel experience I have ever had. I have traveled extensively for work, but not much in Europe and never with a group. If your aim is to make us independent travelers you failed in that we so enjoyed traveling with these particular guides and group that we are now sold on the concept of group travel. "This is such a difficult question. So many WOW moments. Switzerland defintely. Tuscany a close second. Of major sites, the Colosseum." Although I began the tour with uncertainty over what would lie ahead for myself and my fellow travelers, I can honestly say that I loved every day of the journey and have wonderful memories of each place visited. The "Best of Europe" tour can never show you everything, but the high points of touring through - and learning about - 5 or 6 different countries along the way truly created a wonderful experience for all of us. Marijan was an incredible gift to all of us as well as our special guide! "The tour gave us the opportunity for free time to explore if we wanted to, and so in Switzerland, while most followed Marijan to the highest peaks, I chose to spend the day walking the the valley near Lauterbrunnen, hiking up to Staubbach Falls, and on to the incredible experience of Trümmelbach Falls! What an amazing day and the views were picture perfect! Later, took the train to Wangen and loved the views from there as well, and overall, Switzerland will remain in my heart and memory forever!" It was great. We booked the on short notice, only three weeks before the tour, and because everything was taken care of ahead of time, we were able to have a great tour without having to do all the leg work. We were able to use Rick's guidebook and quickly come up with a plan for our free time. "The trip was amazing! The trip was a "wow" moment for 14 days." Phenomenal and unforgettable. A much better tour experience than expected. The narrative of the trip tying the rest of Europe with the Roman Empire, fit the stops and sites visited perfectly. Plenty of freedom to explore on your own when you wanted, or join the group. Honestly a perfect introduction for my mom to Europe overall whom had never been before. "I was a sucker for Venice St Marks Square late at night. I could have easily spent a week trying every menu item and dessert from the major cafe's lining the square while enjoying a beverage and the orchestra for hours. The rare (lovely weather, not too hot, not too cold) made exploring and getting lost in the city all the better." The tour was a great balance of group and free time. Marijan was extremely knowledgable about european history and gave us great lectures on the bus. The local guides were also amazing, and they were all able to give us a good sense of the places we visited in the short time we were there. "Probably driving through the alps for the first time." "We were standing in front of a window at Rome Capitoline museum, surrounded by ancient sculptures, facing outdoor open spaces, covered by ruins of Forum from thousands years ago, under thunderstorm and lightening. It was a truly awesome "wow" moment that I'll never forget." It was more then I could have imagined. Everything was great from beginning to end. Darija took great care of us and guided us in a seamless fashion providing the information along the way with a "library" on info on the area we were coming into and a historical perspective. Eric our bus driver was impressive and cordial...we were all amazed at how he could drive and turn that bus in the tightest place through crazy traffic. "OK...this is a tough question because there were so many...every area had a WOW moment so I am not sure I can really rate the WOW moment at the Swiss Alps to the WOW moment at seeing the ruins on Rome. I was pretty much full of WOW moments!" My overall experience was almost perfect. The taste of each country and city that we visited, was just enough to make me want to return to my favorite places, and/or do another Rick Steves tour! "My favorite "wow" moment was the cooking demonstration and dinner in Tuscany at the villa we stayed in for two nights." We were hoping for a guided into to Europe. We got that and more. Great guide, friendly co-travelers, and a lot of background and historical information we did not expect. It was great! "The biggest moment for me was ancient Rome. I was struck by the scale, and how the city has incorporated and built around the ruins. My second favorite spot was Beaune. The Medieval nature of the town was a nice surpise, along with the hospital and light shows. Oh, and the water cannons opposite the Eiffel Tower were completely unexpected." the tour fulfilled all of our expectations from beginning to end. Everything was very well planned down to when we would need a break from the big city crowds. Our tour guide, Darija had great knowledge of the cities we were in and our bus driver Eric was amazing! "There were so many, but for me it was Venice!" This has been the best experience exceeded my expectations. It was so organized and well thought through. We will only go on Rick Steve tours!! "I had too many but I think it has to be the Swiss alps they took my breath away. The beauty of God's creation was over whelming." Marijan was marvelous, brilliant, professional, timely, jovial, courteous! The pace was very fast but necessary in order to do all that was scheduled for completion in just 14 days. The record breaking heat wave made the pace brutal. Marijan, Apostolos and Big John the driver always had answers to our questions. The chosen sites were a great mix! Including Tuscany in the tour was the sales point for me!This was my first group tour - nothing to compare it to, but top notch in my opinion! "Seeing God's creation on the Schilthorn on such a beautiful morning and then hearing Amazing Grace being played on the Alp Horn in the evening of the same day!!! A truly "amazing" inspiration!!!" We expected a lot from the tour but didn't expect it to be fantastic on all levels. This was our first trip to Europe and decided to go with a Rick Steves tour more for convenience as I didn't know any other language other than English. I had done research for several months before booking and decided this was the one to give us a good insight to Europe. It certainly gave us more. Now we are home we can't stop talking about it. "There were many wow moments but the wowest for me was arriving in the Swiss Valley where we were to stay for two nights. Seeing the beautiful mountains and breathing the clean, fresh air was the most incredible experience." All aspects far exceeded expectations. Great choice for first Rick Steve's trip as we got a great overview of several places. Great balance between group time and free time and included meals and meals on own time. Other tour members were outstanding and also added to this awesome experience. I have made new friendships that will last a lifetime. John our bus driver needs to be praised as well! "Hiking in the Swiss Alps! So beautiful and peaceful! But can't forget the feeling at the fist site of the Eiffel tower and the Colosseum." Our tour was incredibly amazing! From out first meeting to our last send-off dinner, it TOTALLY exceeded my high expectations. Everything was obviously well-thought out. The timings of every activity, every dinner, every tour, every detail were PERFECT! I loved the mixture of "Highlight sights" and free-time to explore on our own. I thought the hotels we stayed in were PERFECT, extremely cute and their locations were EXCELLENT! Local guides and Marijan were also amazing! I'm in awe of this tour! "This tour had multiple WOW moments each day! I couldn't wait to get up in the morning and see what was next! My jaw hit the floor when I first saw the Roman Forum and Colosseum. Paris was amazing, from the Eiffel Tower to the Arc de Triomphe to the Metro and the Mona Lisa! Munich and its Beer culture were SUPER FUN! I loved Switzerland's scenery, our North Face hike, and chance to play the Alpine horn! Seeing "David" in Florence was unbelievable as was the food and drink of EVERY country!" Our guide, Marijan, was amazing. He was a wealth of knowledge and very helpful We also had the benefit of an apprentice, Apostolos, who was equally as knowledgable and helpful. Our driver, John, was fantastic too! We were very well cared for. My tour experience was fantastic! I would definitely travel with a Rick Steves tour again. You get a lot for your money and the tour group size is perfect. It was great to get to know other people in the group. "Touring the Colosseum in Rome. Our guide was fantastic! Other wow moment was the Swiss Alps. Going to the top of Schilthorn was priceless." Our tour was blessed with both outstanding guides and fantastic tour mates. We totally enjoyed our travels throughout Europe and the amount and depth of knowledge afforded to us by our guide Marijan was second to none. His vast knowledge of the history of everything from ancient civilizations to the current political climate and the art that falls in between was absolutely amazing. Our group was a very cohesive one, everyone bonded quickly and there was no drama between couples. "For me, it was the sheer beauty of the Swiss Alps. My wife was enamored with Paris." What an amazing experience! We saw and learned so much during this trip. It was the perfect balance of guided tour along with personal free time to explore on our own. The guides were unbelievably knowledgeable, personable, and helpful. This was the perfect way to introduce ourselves into guided touring. Would definitely do another one! "Each new day brought a new favorite. You know it's a good trip when you can't pinpoint one particular thing. I was continually "wowed" throughout this tour." Our tour guide was phenomenal and will be hard to top in future tours. There were so many little things he did to make the tour enjoyable. He was always upbeat and very knowledgeable as well as other things. Our tour apprentice, though he was very different, was very helpful. I am confident that he will be a wonderful tour guide as well. Our tour buddies were wonderful and we made so many friends that I believe we will visit when we are in their area. "Seeing the David at Accademia was one of my favorite "wow" moments. Marijan gave us such a detailed explanation of Michelangelo's process and what to look for. If I had not been given all that background, I might have been impressed, but might have said, "That's nice" and walked on. I also enjoyed the gondola ride in Venice. Since we had just celebrated our 30th anniversary, we sat in the boat with the accordion player and singer. Some may think it was corny, but I thoroughly enjoyed it." Tour itself, guides (including the local ones) were excellent. All the little extras by Marijan and Apostolos (champagne atop the Shilthorn, Amazing Grace on the Alp horn) were wonderful. Hotels were nice, staff friendly and professional. Our bus driver, Big John, excellent driving and even when "off duty" sharing his knowledge and comradery. All these really helped make our experience great. "Sorry, there is no one absolute moment. (1) Understanding the Romans' need for memorializing themselves because they didn't believe in an afterlife-- a belief in heaven-- or in God. This makes my belief in both all the more precious to me. (2) Being immersed in different people, places, and cultures." Our adventure from Paris to Rome was the most meaningful, mind-expanding, "travel-education" our family has ever experienced. It was my fifth time traveling in Europe, my husband's third time and our son's first time (although he arrived twenty days prior to our tour for an intensive, university-level, study-abroad program in Germany and Austria) – this tour was perfect for all of us. Every day we enjoyed learning and exploring as a family. We can't wait to do this again with another itinerary! "While on the tour, I loved learning so many new things about each city with our gifted tour guide as well as our extremely talented local guides and resident artisans. Along with the Swiss Alps, my favorite "wow" moment from the tour is still happening every day as I make connections with places we traveled, only now I'm at home reading the Great Books or watching shows on Netflix like PBS/BBC Dickens' Little Dorrit (Venice) and Empires (Florence, Rome). The learning continues." Our tour took us to places that I only dreamed of!!! The people I met in our tour group were wonderful. Our tour guide was outstanding! "French people dancing in the streets after winning the finals. People ringing bells in the streets in Switzerland then leading us to a place where they were playing the Alp horn. Getting a cooking lesson then eating outside in Tuscany." "Views in Switzerland and gondola ride." Trip was as I expected. Tour was a great way to give someone an overview of the top cities in Europe. "View of mountains from Hotel in Lauterbrunnen." This was our first Rick Steves tour and our first trip with a tour company. We couldn't have asked for a better experience. Having arrived in Europe a few days before our tour started, I learned quite quickly how difficult it is to manage traveling overseas and was ready to turn it over to the pros. Top notch all the way around from our guide to our driver to our hotel hosts. Amazing group of people and very appreciated! "The great thing about this tour is that there was a "wow" moment every day of the trip. Overall "wow", Swiss Alps and Lauterbrunnen, hands down. I do have to say that our favorite moment came in Munich and it had nothing to do with scenery, museums or sights. Two young men approached our table and asked to sit with us. We accepted and spent over an hour chatting with them. Amazing impromptu experience!" The overall tour experience was very good. The tour guide was excellent. This tour was the best graduation present I got. I had an amazing time!!! "It's really hard to pick a favorite moment when everything is just so different from what you imagined. The entire experience was incredible." Fantastic Trip! Very well organized set us up to be a traveler not a tourist. I had never done a tour like this, and I was extremely pleased with the way we were prepared in each stop on what to ask and how to interact with the "locals" and not look like an American. "We had a wow moment in each stay. In Paris, just being so close to the Arch de Triumph, and seeing the Eiffel Tower was pretty spectacular, especially at night. Beaune it was very special to celebrate France winning a world cup semi-final game. Switzerland - Mountains and waterfalls. Munich - Beer!! Venice, gondola ride and getting lost. Florence, David! In Rome, I just like the mass of people, along the Colosseum and other museums." Well organized with a good mix of structured and free time. "Impossible to pick one [INVALID] hard enough to pick just a few. Among the many, many "wow" moments: the lighting of the Eiffel Tower, hearing the alphorn in Wengen, the Capitoline Museum in Rome (including the first glimpse of the Colosseum) with our local guide Francesca [INVALID] and the first time I spoke French to a French person. The light show on the buildings in Beaune were an unexpected highlight. I have to mention the group of people we toured with were such so much fun, definitely a "wow" too." I was nervous heading into the tour. I didn't know how I would like being on an agenda instead of having full control of my schedule while on vacation. But the tour was fantastic, the amount of "stuff" that we saw and learned in limited time was remarkable. even the bus rides were fun, as so much of the scenery was both beautiful and interesting. Plus, everyone on the tour was great, which i think has to do with Rick's mandate of "positive attitudes only". "Being lucky enough to be in Beaune for France's semi final victory over Belgium was hard to beat. I believe i was more impressed with the engineering and architecture than the art, so Rome was a pretty big wow moment. and the scenery in Lauterbrunnen was unbelievable, i never thought i would see anything that would make me think Yosemite looked pedestrian." My 15-year old son and I had a wonderful, enriching and super-fun experience with a group made up of delightful and educated fellow travelers. For anyone looking to take teenagers to Europe, this is OUTSTANDING value for your money. Guide Carey, driver Big John and our local guides (especially Francesca, National Treasure) made sure we were comfortable, well informed and empowered to make Europe our own. "Walking a country road in Lauterbrunnen with the Alps as a backdrop, among mountains, the pine forest, sparkling cool streams, towering waterfalls, flowers, cottages, farmers and fresh air. It doesn't get any better." I had an amazing time on the tour. Being a teen I was concerned about some things being more adult oriented, but this wasn't the case at all. I felt that There was always things for me to do. Our guide, Dave, was very good about making sure we got food that was okay for our dietary restrictions. I loved the people on our tour they were all nice and fun. Dave was also very knowledgeable and did a great job of telling us about the places. The local guides we had were all amazing. "My favorite "wow" moment was seeing the Eiffel tower sparks at night. I had wanted to go to Paris for a long time and it was amazing to finally be there. The Eiffel Tower was so pretty and seeing it light up and sparkling was gorgeous. The other "wow" moment which was a close second for me was the Swiss alps. The valley was gorgeous and we were surrounded by waterfalls and mountains. It was nice to be somewhere scenic and relaxing after the chaos of Paris." The transportation, hotels and guide provided a hassle-free experience! "The unexpected "wow" moment was walking into Saint Chappelle in Paris. One of the favorite "pinch me" moments was the night time gondola ride in Venice!" We had a delightful time with just the right mixes of city and country locations and of organized and on-your-own time! "My two "wow" moments (I can't choose one favorite) were the Lauterbrunnen valley and the Swiss village nestled within the majestic Alps, and Rome with its art, architecture, and amazing history." Your was awesome ! Dave our tour guide helped make it special--always kind and patient and full of historical useful information. This is a great Tour to see a sprinkling of Europe-- Not enough time to have a detailed tour of the city but certainly enough time to see the sites and appreciate the flavor of the country. "All of it Switzerland, the Tuscany farm, Munich." What can I say? Dave Stringer was fantastic. Calm, cool, collected and helpful in so many ways. He made the trip such an exceptional experience.We were constantly on the go, but because of our wonderfully small group size (22), and the amount of free time on our own, we never felt herded like cattle or upset with our fellow group members. I loved that Rick Steves took care of the big things, which left us time to explore on our own- meeting people and finding little out of the way places. "I loved Tuscany and Beaune. Tuscany eating under the huge walnut tree among the vineyards was a wow moment for me. The food, the wine, the place -all good!" This was our very first tour EVER, and I can't say that there was a single thing I would have changed. Colleen and Meg were absolutely OUTSTANDING! They were informed, understanding, witty and so very kind. All the city guides were wonderful, especially Francesca in Rome. She taught and informed us in such a way that not only pulled at your heart strings but also gave me the opportunity to reflect on history and the significance of where we were standing. "For me, standing in the middle of the Colosseum in Rome was an unforgettable moment that quite frankly brought forth so much emotion. This was the crown jewel of the trip. I would recommend this to ANYONE! The Alps were a close second, such beauty and pristine landscapes." Was pleasantly surprised at how smoothly everything went. It was a great trip. Colleen and Meg were fabulous! This tour exceeded all of our expectations. Peter was a great driver. "I loved the entire trip, but the best moment was in Tuscany and the mask making demo in Venice." The whole tour was spectacular, it was more than I would have ever expected. Our group was unbelievable, we all got along, laughed and enjoyed every minute. "My favorite "wow" moment was conquering my fear of heights as we climbed to the top of the Schilthorn. The view was breathtaking and totally worth every moment!!" Amazing experience! Completely different to what I was expecting. Coleen made everything run so smoothly and was always prepared. All the cities and places we went to were perfect! Our guides make us feel secure, welcome and appreciative. I will definitely use this kind of tours again!! "So hard to pick one, but to see the Roman forum from the top of the Capital museum was an overwhelming experience." The pace was fast but never chaotic. We got to do the touristy things but I was most impressed by the added perks and activities that weren't mentioned in the itinerary. I won't mention them here to keep it a surprise. Our guides were knowledgeable and very friendly. They were also extremely accommodating and were very aware of the group dynamics. Speaking of the group. It was a very nice group of people that kept us entertained they whole trip. "The beauty of the valleys and mountain peaks of Switzerland. I learned that I enjoyed the small towns we stayed in were just as enjoyable as the major cities. I think that alternating of big city and small town made the trip that much better. That was a wow moment for me. I hadn't expected that." I had a wonderful time! My husband and I had taken the 3 week tour 11 years ago and we liked it so much that we took our grown children this time. "My favorite moment were the evenings we spent in Tuscany. We stayed on a beautiful farm. Our meals gourmet meals were served at a table on the lawn. There was a cool breeze and no "bugs". It was magical! The second evening local musicians performed for us and we danced on the lawn under the stars until almost midnight. We had such a good time!" I liked how the tour had alot of variety and how I think we got a fair mix and balance from each country. My favorite things in each city were the city guided tour walks, and of course the food was very good anywhere we ate at. "Europe had some amazing views and the overall atmosphere was very good. I think my wow moment was in the Swiss Alps, when we rode the gondola up to the top at Piz Gloria and saw the James Bond, then ate lunch in Murren, and then took a 2 hour hike back to the other gondola on the opposite site of the Lauterbrunnen valley to ride back to the hotel, in all I walked about 7 miles that day and it was by far my favorite." This is the second Best of Europe tour I've done (2005, 2018). I chose the tour again to take my daughter and because of the great experience I had the first time. This one was as exciting and fun packed as the first one even though I had been to a lot of the places already. Jodi our tour leader did an excellent job of preparing us for each stop along the way whether it was just a lunch break, or giving us an introduction to Austria as the bus was crossing the border! "We visited the Dachau concentration camp in Germany, then the American Cemetary in Italy which presented 2 very dramatic perspectives of WWII. You could only say WOW for very different and divergent reasons after visiting each cite. These were in promptu stops planned by our tour leader Jodi!" We greatly enjoyed our tour experience. We loved the way the tour was organized and planned. We were able to see great places, meet great people, and felt comfortable the entire time! "So many wow moments, but the drive into the Swiss Alps and the hike from Muren was simply outstanding!" Wonderful tour experience! Vey well planned tour with quaint hotels, great guide, good bus and driver and adequate bathroom breaks. The tour happened as advertised and exceeded expectations in some cases. Additional things like birthday celebrations and unexpected small activities made this trip special. Jody ran an efficient tour with minimum time delays. "There was at least one "wow" moment everyday. Getting up to the Swiss Alps and hiking down was my favorite moment." Good [INVALID]ion of venues. Outstanding guides and driver. Nice mix of people on the tour to talk with. Only Rome came in as too hot and too crowded with tourists like us. Most everywhere else was truly " off the beaten path" just the way I like it when I go on my own. "I've been all over Europe but never to the top of the alps. So Schilthorn was a Wow for me. Plus real Edelweiss- is never seen a living flower of it before. Plus we ran into an unexpected music festival in France and just happened to be in Rome when the Pope gave his blessing- serendipity." Just back a week from 14 days in "the Best" of Europe, and I'm quite sure that it was. Not "best" in the five star hotel, gourmet meals every day sense, but BEST in the way people become BEST friends, in the way that the little place you went to had the best ____ you ever tried, best guide you ever had, constantly seeing to your finicky "needs" and teaching you how to do it "the Rick Steeves way". OK, maybe not the rip-off pants that become shorts that you can swim in, but I swear by all else! "Watching my two, somewhat quiet, teenage boys suddenly blosssom into hospitable, inquisitive, smiling! gentlemen when surrounded by the five teenage girls in our group. At our first group meeting, our more um, "choosy" son actually shared that he was looking forward to trying all the foods from the different countries on our tour. And he DID! And he still continued this when we returned. So, this happy mom has got to say, "THANK YOU, Rick Steeves!"" The tour exceeded my expectations and I had a lot of fun the whole way through. I learned a lot about Europe and the countries that I visited. Overall, I have no complaints and I had a great time and would defintitely do a similar tour in the future. "There were many moments that I would describe as "wow" moments during the tour; but personally, my favorite part of it was the Swiss Alps and getting to go to the top of them and do a bit of hiking." I love Rick Steve's tours. This was our 4th tour and it left nothing to be desired. We were particularly pleased that since our 18 year old granddaughter was able to find other Graduates to "hang out with"on our tour. Dave, our guide was exceptional as I'm sure you already know. "Since we had been to the coliseum in Rome before, it wasn't as breathtaking as our first. However , the Alps made up for it in spades. It still gives me a thrill to even think about them. The Rockies don't hold a candle to them!" Our tour was all about making connections, with new people, places, cultures,foods, information and experiences. We loved the comfortable coach that we traveled in. Our Tour Guide's helpful hints and background was key The balance of city bustle and natural beauty was invigorating. Tis'exciting to begin each new day with the anticipation of adventure and the opportunity to learn. The warm welcomes received from lodging and restaurant owners furthered our connection to a new place. "There were so many. Mine would have to be the stunning beauty of the Alps." On time. Lots of information. We were able to see many sights. Dave did a great job. Very, very informative. Outstanding people in my travel group. "Many! Swiss Alps Rome Colosseum Waterfalls Beer Garden"
My daughter Rebecka and I had a fabulous experience in Europe! Any apprehensions I may have had about traveling in Europe were of no consequence. We stayed in very nice hotels, and we had no worries about what we were going to see or where we were going to go. The schedule was easy to be on and well paced with structured time and free, personal time. We saw all the important artwork, and iconic architecture in each country we were in. I am still processing all the experiences! "It seems every moment I experienced was a WOW moment! In Switzerland there was a waterfall outside our rooms window! I took five pictures of it because I couldn't believe it was real! Dachou moved me to the depths, and I must admit it colored my experience of Germany. I am glad I was able to "witness" it and wouldn't have wanted to missed it. Our stay in the country in Florence was a nice break from the city! I felt like I was in a Fellini movie! The Colosseum stays with me to this day"
This tour truly exceeded my expectations. Every part of it provided memorable experiences that I could not have replicated without our awesome tour guide Dave, or any of the wonderful local guides that we had along our travels. It was a perfect mix of group and individual activities. We learned how to navigate the Paris Metro, be good tourist in the tight streets of Venice, and how to "see" the wonders of Rome in context and with a level of understanding I could not have anticipated. "Spending time with our local guide in the Capitoline museum in Rome. I am not sure why but I found it very moving. It is hard to pick from many awesome sights. Then there are just all the small moments experienced with a new set of friend. The Trummelbach falle in the Swiss alps, the Munich surfers, the dancing under the stars at our Tuscan retreat." My daughter and I went on the tour together and had a great experience. It was so nice to go on a trip like this and not worry about transportation between the European cities, booking hotels, getting tickets for the many museums, and having to decide where to eat for every meal. There was a good mixture of tour group time and personal time in each city. Our tour guide was experienced and had good suggestions for restaurants and alternate activities. The local guides were great. "This is not a fair question because there were so many. One of the more awe-inspiring moments for me occurred while we were on our hike in the Alps. The views were amazing and stunning. I found out that pictures did not do the view justice." Every location on the itinerary was a great experience, I'm really pleased we chose this tour! "Each day provided a new "wow" moment!" I enjoyed every place visited on the 14 day european tour. Each location had distinctly different character. Since I had never been to Europe before I felt I needed the guided experience to get the most out of my trip. All the guides were very good (although sometimes hard to understand because of their accents). The headsets allowed everyone to hear the guide and navigate the walking tours. The tour bus was very comfortable. There was a lot of walking to burn off all the food provided. "I really enjoyed the Colosseum and surrounding grounds in Rome. Living in the US, we think a one hundred year old building is old and should probably be torn down. The real facts about the gladiators and the games was really interesting. Venice was also so unlike any other place in the world. The waterways and alleys were a real adventure." The tour far exceeded my expectations. I loved the fact that our hotels were all in the old part of towns. Our guides and the local guides were top-notch and with radios and ear buds it was perfect. We had an amazing cohesive group, a fantastic bus driver, and 2 very professional and knowledgeable guides. It was a pretty fast-paced tour, lots of walking and stairs but it totally worked because of how organized our guides were. "I cannot pick one. Paris was not my favourite. We could have used an extra day in Lauterbrunnen. It probably was the most spectacular as we had a clear day at the top of Schilthorn and the Swiss Alps." This was my first trip to Europe and I thought it was a great combination of cities and towns. Being able to make our own plans every other day or so was great and we even skipped the long day trip into Florence to relax at the Tuscan villa. Our guides were great and we could not have had a better group of people. I was worried that my 17 year old son would be bored with a bunch of retirees but there were 4 teens and all of us had a great time! "A six mile hike into the Alps with my 13 year old granddaughter sharing the beauty and splendor of these mountains had to be a wow moment. Watching her awe as we descended to the valley after our hike was an experience I will never forget. Our 16 year old grandson was totally in awe of grandeur and history of the parthenon temple in Rome was another wow moment. I might add that this was the fourth trip to Europe for my husband and me, so our focus was mostly on the kids and their experience." Just wonderful. Incredibly well done & organized. "Sailing through the Swiss Alps surrounded by waterfalls." "The Lauterbrunnen Valley in Switzerland was unbelievable. It looks like every postcard or movie from the Alps. This is coming from an avid art lover who was sure nothing could beat Paris." This response is coming from both Roger Hansen and John Payton. The overall experience very full and rich. It gave participants the full experience described in the itinerary. There was a good balance between city, small town and rural sites. The pace was rapid, which presented some challenges. Yet we chose the optional tours, since we wanted to experience as much as possible. "Hiking in the Alps gave us the opportunity to see spectacular scenery, both in the valley and up in the mountains. We had a waterfall outside our hotel window. Churches such as San Marco gave us human-made wow moments. The gondola ride on the Grand Canal was magical. The music and dancing at the Tuscan villa movie-set like setting was very enjoyable." This tour exceeded our expectations. We saw more, learned more and experienced more than we hoped would happen. Our guide, Colleen, was knowledgeable, experienced and always willing to help. The entire tour was well-planned and [INVALID]d. I especially appreciated the balance of planned activities and free time to explore on our own. We had a great tour group of congenial, interesting travelers. Best of all, I feel more confident about traveling in Europe and would love to go again. "Impossible to choose one moment! Being in the Louvre with a feast of treasures, the beautiful Swiss Alps, riding down the Grand Canal in Venice and historic Rome are my contenders." I loved the tour! It was a wonderful experience. Colleen has just the right mix of knowledge, humor, and sensitivity. I had never been to Europe before and now I want to go back for sure. I loved the human interactions we had with local people--they really add flavor and make it so much more memorable than just sightseeing. I would highly recommend this tour. "I have 2-3 wow moments. The first couple would be listening to Baroque music in cathedrals[INVALID]SO AMAZING! The acoustics, the art of the buildings, and the talent of the musicians all came together in one perfect moment. I'm now convinced that Baroque music was written to be played in cathedrals. Second wow moment was when our Beaune hotel owner told us she loved us because: 1-she loves Colleen, 2-she loves US locations, 3-we saved her country from Hitler and fed them after WWII. So touching!" Such an amazing experience! Colleen was fabulous! She was enthusiastic, knowledgeable, personable, and really made significant effort to cater to individual needs. Thank you colleen!!! "The Swiss Alps truly were AWESOME! and Venice was another big wow! But really as a first time visit to Europe, the whole trip was kind of surreal!" I enjoyed all of the places we visited, even those I thought would not be much fun. I saw things I had not expected in these places, and loved it. The hotels were all near the city centers and within walking distance of many of the sights. (Except for that fantastic Tuscan villa which was a great relaxing change of pace just when we needed it). The pace of the tour allowed us to pack in more sights and experiences than I would have if left to my own devices. The group became a family. "Seeing the four ancient bronze horse statues in St. Marks Basilica. They were powerful and lifelike, at odds with what I thought 2000 year old art was or could be." The tour was even better than advertised. There is no way we would have seen or done what we did on our own. The Rick Steves company has really put together an outstanding product for travelers with all ranges of travel experience. "Many places come to mind, but seeing the Alps up close has to be tops for me." We could not have had a better time - the weather was ideal the settings spectacular. My initial expectation was that each part of Europe would be similar - what we saw was the unique flavour of each of the countries we visited. Had we planned the trip ourselves we likely would have lost much of the character of Europe, from the boutique style hotels to the selection of meals to the important background our guide provided. Excellent ! "There were many - from the shear size of some of the locations we visited to the amazing artworks - including paintings that filled an entire wall. Watching the sun set in Paris from the top of the Arch de Triomphe, a gondola ride in Venice to a casual stroll through an Olive grove and vineyard in Tuscany." Our best of Europe in 14 days tour far surpassed all our expectations. From our wonderful guides, Jody and her assistant Rachel, to all our fellow travelers. With everything so well organized all we had to do was enjoy everyday. The local guides were like an added bonus, sharing their local knowledge and history provided added insight to everything we were experiencing. "For me it should be favorite wow moments since they seemed to happen on a regular basis. If I had to choose one it would be our tour of the Colosseum and the Forum in Rome. Our guide, Francesca, was fantastic how she helped us to see and feel what life was like so long ago. Without her they would have been old buildings to me, but thanks to her they became so much more. I could practically hear the ancient Romans cheering." My husband and I felt like we had "a trip of a lifetime". We loved: the cities that were selected to visit, the chance to see the beautiful countryside on the bus and relax after busy sightseeing, the bonding we had with our tour guide, Jody, and the rest of the tour members, the use of local guides for some sights that gave us the details to really understand and enjoy the sights, looking at each other often to say "Wow, we are really here"! "When I challenged myself and climbed through the chain link tunnel at the Thrill Walk in Switzerland, with nothing but air and mountain below me...twice! When we saw the miraculous view from atop the Schilthorn Mt in Switzerland." This was my first travel experience with a tour. There was a lot packed into the 14 days. While it was made clear that it was going to be a very active tour it was still a bit tough and you definitely need to be fit to keep up. It was organized very well and our two guides were knowledgeable and fun. We experienced eating great food in every country and learned about their customs. The beauty in each country was amazing. "I don't have one! The beauty of Switzerland was absolutely breath taking! Paris bus tour at dusk was awesome...Eiffel Tower especially. Loved the gondola ride at dusk in Venice. In Munich, the local beer house with the 3 musicians was so much fun as they engaged everyone to join in singing. All the sculptures, architecture are my particular interests. The colosseum was amazing. I appreciated stopping at the American cemetery in Italy and Dachau concentration camp memorial." From the first day to the last, every day was an adventure. I enjoyed the hotels, group meals, the tours and the time on our own. I enjoyed the way that Jody and Rachel helped us to feel comfortable in each stop and taught us to be travelers, not just tourists. Taking us on the subway as a group and then giving us tickets to get back on our own was so empowering. I have never heard of a group tour doing anything but getting on and off buses. "The hike in the alps up to the thrill walk on the Schilthorn was unforgettable." This was my first experience on an organized tour and I was a little hesitant to commit for such a long trip but I am so glad that I did. The tour totally delivered on everything they advertised but it was all the little 'extras' that weren't advertised that put this trip over the top for me. We participated in all of the 'optional' events and as one of our tour mates put it, 'I'm afraid I'll miss something wonderful if I don't'. It was a true immersion experience of the best of Europe! "My personal 'wow' moment had to be the gondola ride in Venice. In anticipation of our trip, I had read the book '1000 nights in Venice', a romantic novel based on a true story and filled with details about the city and the very passionate people who live there. As my husband and I were celebrating our 31st anniversary during the trip, our tour guides arranged for us to have live performers in our gondola. It was incredible! I couldn't stop smiling for hours. Thank you Jody and Rachel!" The trip was extremely well organized and coordinated. There were no issues with hotels ,transportation, or resturants. Jody was phenominal about making things happen on time. The places and sites chosen for the trip were amazing. The bus driver (Winn) was friendly and intesting to talk to. "The sites in Rome were the "wow" several days." We have traveled a lot and this was the best tour we have ever been on. We had so much fun and learned a great deal. Our overall tour guide was outstanding as were the local guides. Everything was so well organized. "Our favorite was Switzerland. We had not been there before and it was so beautiful." From the start in Paris to the ending in Rome, it was fabulous. As advertised, there was plenty of walking in order to take in all the sites. Being this was our first trip to Europe, we did it all and were glad we did. Our guide, Jody, Vim the bus driver and Rachel from your HR group were so much fun to be with. We also had a great group of folks who seemed equally intent in going with the flow and having a good time. Your guidebook helped us prepare for the trip and your app was great too. "I always wanted to hike in Switzerland. Getting off the gondola and starting our walk to Murren was like wow. I thought I was on the first step of the stairway to heaven. Incredible scenery and perfect weather in a postcard setting. Dining outside in Murren as hand gliders flew overhead was an unexpected plus." I really appreciated having one guide who accompanied us the whole trip. Jody was so knowledgeable about history and geography as well as an excellent source of information on what to do and where to go during our free time. There was so much we would have missed if we had done the trip on our own. The local guides deepened our understanding of each location and were invaluable in learning about local culture, history, and what it's like to live in the community we visited. "It's hard to choose one. Francesca brought the ancient Romans to life, incorporating art, architecture, religion, and everyday living. She gave us a truly unique perspective on Rome. Also, the hike in the Alps, from the Lauterbrunner to Murren, especially during wildflower season, was breath-taking." I was skeptical about being "trapped" in a tour, but my doubts were unfounded. Our guide, Jody, was a font of knowledge (she did have google on board), generous with good advice, and the structure of the tour allowed us to have enough free time to wander on our own and find our own treasured moments. The local guides were outstanding - incredibly helpful in putting our tourist minds into the local context, and giving us insight into the history and current situations of the local people. "Too many to just pick one: The Eiffel Tower at night The Gondola at Schilthorn Dachau and the U.S. cemetery in Florence Our Munich tour (double wow!) The mask maker in Venice Food Wine Food and Wine Pork Knuckle and dark beer The Colosseum"
We absolutely loved our Rick Steves Best of Europe in 14 days tour. We enjoyed everything from the well organized local tours, the smooth travel and everyday bits of advice from our wonderful tour guides, Jody and Rachel. We enjoyed the special moments of the Alpenhorn performance, cooking demonstration in Tuscany, to the mask making demonstration in Venice. These helped make our experience so much richer and more memorable. The camaraderie of our group was the cherry on top!! "My favorite "WOW" moment was walking in the Swiss Alps. It was a "pinch me" moment that I will always remember. It was a glorious day with views that are indescribable." I have nothing negative to say about Rick Steves tours. This was our first trip with Rick Steves, and I was very impressed. Our tour guide Ben was incredible. He went above and beyond to make our experience in Europe the best it could be. We consistently skipped the lines for major attractions, which gave us so much more time for exploring. This tour was a perfect balance of learning history, having guided tours, and free time. The price was SO worth it for what you get! 10/10 recommend! The entire trip was outstanding! Every phase of the trip could not have gone better. The accommodations, the travel, the tour guide, the food, and the itinerary all exceeded expectations. All of the hotels were close to the heart of where we would be exploring, but they were much more quaint and fun than we would have likely been able to find on our own. The tour bus was big and new, so travel days were comfortable. Plenty of time was provided for personal site seeing. "We were fortunate enough to get to walk into the Roman Coliseum through the gladiator entrance. The weight of that moment was not lost as I imagined all those who had walked through it to the cheer of crowds, knowing they would not walk out." This tour was so much more than I could have hoped for. I had not heard of Rick Steve's before booking and now will be singing it's praises for anyone who will listen. I loved how the tour was organized (busy day followed by easy day), the tour guide that was with us, and the local guides. I loved the hotels weren't chains, they were locally owned and we met the owners at most venues. The meals were true to the location and all gave you the opportunity to taste what was popular to that region. "All of it was a 'wow' moment! I fell in love with the tour more and more each day!" I was very pleased with both the knowledge and overall friendliness with the group guides ,Ben and Iris. The trip was well organised and varied in staying in a big city and alternating with a small city. I learned alot about European history and art. I also enjoyed our free time so we could plan our own activities. I wish I could go back with the same group! "Too many to chose from . Switzerland was gorgeous and going to the castle for the wine tasting was great . Enjoyed the family- style hotel in the middle of the olive grove. I guess if I had to pick one it would be stepping out of the Rome Metro and seeing the Coliseum. Dachau also is something I won't forget ." I can't get over how spoiled I felt on this tour. Yes, it's a go, go, go experience...but it's so worth it. Every day Ben would surprise us with something. Wether it was treating us all to gelato or entering the coliseum at the gladiator's entrance. It was always something and always amazing! Every where we stayed was clean, comfortable, and convenient. "Entering the coliseum in Rome." It was an excellent. Good mix of large cities and smaller villages so you could get away from crowds a bit. It was nice having someone else do the driving and figuring out all the details, hotels, guides, etc. our driver Erik was like one of the group and an excellent driver. I am glad I did this tour as my first visit to Europe, because Big Bang for the buck. However, my next tour will probably be of a smaller area, such as countryside France, Spain, or Ireland. "There were so many. Venice and it's canals were so unique and picturesque, and the ruins in Rome were impressive. Hard to believe there are so many old buildings and works of art that are still around after a thousand years and so many wars." The experience our family had with the Rick Steve's 14 day best of Europe tour was outstanding. I would not change a thing. It was much more than we expected. I feel we fit more into 14 days then we could of planning the tour on our own. The guides were all top notch! "My favorite "wow" moment on our tour happened after we left the little church in Lauterbrunnen, Switzerland. As we walked out of the local church the church bells started ringing through the valley. I looked up and saw the waterfalls and all the beauty of the Swiss Alps in the background. It gave me goosebumps because I realized no pictures or video could recreate that moment! The were "wow" moments everyday of the tour but that moment stood out for me." We had a fantastic tour experience. We had heard good things about Rick Steves tours, and we were not disappointed. We loved everything about this tour! "We were in Switzerland, and had just finished listening to the wonderful performance by the local group in the church, & they started ringing the church bells. We walked outside, & between the beautiful bells, the waterfalls, & the majestic peaks in the background, I was just struck at that moment how peaceful & serene the setting was. My husband turned around & said, "I wouldn't be surprised to see a unicorn run in front of us right now"!" The Best of Europe experience is one that I thoroughly enjoyed and will never forget. The only cautionary note is one directed to myself. "Don't eat so much food next time, regardless of how delicious it is." "The biggest "wow" part of the tour was the time spent listening to Francesca, as she guided us through the Capitoline, Colosseum and the Pantheon. All of the local guides on this tour knew their "stuff" and were able to impart it to the group effectively. Francesca did more than share her information, she shared her vision and encouraged us to take a journey back in time with her. Very impactful!" It was a goal fulfilled by my wife and I. We had a great time. The experience of a lifetime. "It was seeing the Coliseum in Rome." A wonderful introduction to Europe and all it has to offer. Never a dull moment, a busy schedule but worth the time and effort. Every city was different, interesting and amazing! Great to just sit back and just enjoy the experience. Priceless to not stress over booking hotels, scheduling transportation or tickets to museums. It was fun having mostly 1st timers on the adventure. We were all in awe of what we were seeing, eating and experiencing. "Driving into the Swiss Alps and the Lauterbrunnen Valley. The majesty of the waterfalls, the green hills and quaint village." I couldn't believe I was overseas in Europe when I first arrived in Paris, France. The trip was an unbelievable experience. I got to be up front and center with all the famous monuments, sights, and places that I have read all about in history books when I was younger. I got to experience this tour with my family, but also got to meet new people and along the way, make new friends. I am so thankful to have had the opportunity to travel with the Rick Steve's Tour. "Definitely the drive to Switzerland. Switzerland is probably one of the most beautiful places I have ever been to. I couldn't keep my mouth shut, it was just so jaw-dropping beautiful. Taking the tram up and down from the Swiss Alps felt like a dream." This was a great way to see Europe, especially for the first time. A few days at each place with local guides and a planned tour for part of the day, then on your own later to have your own discoveries. I praise the way the tour info is presented prior to and after the tour is booked. The detailed honesty of what to expect, how to pack light, the shape you need to be in, how each day is rated from mild, moderate and strenuous walking and where to refill your water bottle was so important. "Lauterbrunnen Valley in Switzerland was breathtaking. We had a waterfall view from our balcony at the hotel. Everywhere was so spotlessly clean. The scenery of the green grass, wildflowers, the cows with the cow bells freely roaming, waterfalls all around, the gondola ride up to the top of Mt. Shilthorn and the few other little villages along the way up." This was my husband's and my first time to Europe. The "Best of Europe in 14 days" tour was a good "Europe 101" tour to take, as it gives you a "taste" of 4 different countries. We definitely have a passion for further visits to Europe...a return to a few places we visited plus new sites to explore. "A few sites come to mind, but the Lauterbrunnen Valley view from our 4th story hotel deck with a view of the Schilthorn to one side and the grassy meadows with bell-wearing dairy cows to the other direction - Staubbach waterfall thundering in the background...it was a "pinch me - am I really here" moment!" Very well run, kept busy the whole time but also had time to rest up when needed. "In the Rome the Coliseum is amazing but each stop had something that was very good." The trip exceeded all my expectations. Our guide did a great job of preparing us for each adventure. He gave us the history, what to look at, what to expect. Everything went smoothly, no hassles or problems. "My "WOW" moment was probably going to Rome. The history was told in such a way that I felt everything she said. She brought the Colosseum to life for me. St. Peter's Basillica was amazing. And I wouldn't of known or understood any of it, without our guide." We had a fantastic time! This was my first trip to Europe and Reid made it such an enjoyable experience. The group was fantastic and everyone had a blast! "Seeing David for the very first time!" Not knowing what to expect, as I have never traveled to Europe or in a tour group before, I was pleasantly surprised. I thought the tour was well organized. The locations of the hotels, the transportation and sites visited were perfect, with the exception of Eataly. Our family of 5 had a great time and will never forget the time we all spent together in Europe. "Probably driving into the valley of Lauterbrunnen. The views were amazing!" This tour was very active and busy busy busy, but we definitely visited the main places for a taste of Europe. We've been on several Rick Steves tours now, and this may be the "best ever"...Schedule and guide were tops, very very outstanding and memorable experience. "Gondola is my "wow" word. In Switzerland we took the gondola cable cars way top to the Schlitzhorn with fantastic views. In Venice we went together for a gondola boat ride complete with musicians." The trip met and exceeded our expectations. The hotels reflected the character of the local areas, as did the restaurant choices. There was just enough free time, as well. The various side trips, like the Dachau Memorial and the Florence Memorial for the American troops, added a good balance to the visual beauty and good times. "People have been asking us this, and I tell them the WOW moment for each city. The Louvre was special, the charm of the Burgundy winery was unparalleled, the hike in the Swiss Alps was pure delight, the Dachau Memorial is seared in my mind, biking in the English Garden in Munich, the Vivaldi string concert in Venice, dancing at the Tuscan Villa, Michelangelo's David, the Roman Forum, and the fun and interesting companions." Tour itself was good. Good locations, local tours/guides, fellow tour members, mostly good entertainment, etc. I'll preference my comments, I was on the 3 week Best of Europe tour last year, rated it "Outstanding" and the tour guide was EXCELLENT. Loved the tour and on that basis came back with 4 additional family members/friends for this tour. Unfortunately, this years tour guide was only adequate and marred the experience for me a little (knowing what a difference a good guide can make). "Probably Switzerland was the wow moment. Farmhouse in Tuscany was very cool and a lot of fun (great food, fun cooking demo, music and dancing with the owner/staff/family joining in)!" Overall tour experience was outstanding. Really really enjoyed this tour. I'd been planning on taking a RS tour for about 20 years and it did not disappoint. "Do I have to pick one? Favorite wow moment was probably on one of the two optional experiences-the hike with Dave in Lauterbrunnen-wanted to pinch myself-was I really here?? and also the gondola ride in Venice. My husband was cynical about this to begin with-felt like it was too touristy. He looked at me within the first 2 minutes and thanked me for pushing him to do it. It was so romantic being in Venice at night with live musicians. We even had a couple on our tour get engaged during the ride!" The perfect way to take my first trip to mainland Europe. A great mix of guided tours and independent options, seeing some incredible sights. "Driving through the Swiss Alps into Lauterbrunnen - the scenery was unreal." We absolutely loved our tour and will definitely be going on more Rick Steve's Tours in the future! It was a wonderful blend of scheduled activity and "on our own" time! "How can we choose just one?!? Our guides' timing for our hill view of the Eiffel Tower for its evening light show! Lauterbrunnen Valley in Switzerland and the 3-waterfall view from our hotel room! Munich... loved it! Our Villa stay (& our hosts) in Tuscany near Florence. Seeing Michaelangelo's David." It was pretty much as I had anticipated after talking with friends who had been on various tours. I felt it was good value for the money. "The cities and history were great but I really enjoyed the time and beauty in Switzerland." We had a great time! It was a lot of fun and we got to relax and enjoy ourselves and not have to worry about the details. "My favorite "wow" moment was stepping into the courtyard of Count Raul's 12th century castle in Beaune France. Never in my life did I think I would get to experience a castle up close and personal." Although I couldn't participate in some experiences due to personal illness, I enjoyed those I could. I really appreciated the support I received from Trish and from all of the other members of the group. I learned a great deal, not only about Europe but also about myself. The kindness and understanding I received from, Trish, the members of the groups and also from complete strangers, I will remember for the rest of my life. "Probably spending time in Switzerland surrounded by mountains, impressive even to someone like me who, as a citizen of the Pacific Northwest, ought to be used to mountain beauty. Another equally impressive moment was the tranquil beauty of Tuscany. I know it is in Italy and yet it felt like a place i could call home." Outstanding! As advertised, and more. The program is well designed, and is much more "connected" than I could have hoped for. Kudos to the company and our guide who expertly ran the tour and provided much context in a concise and articulate manner. "So many. Sharing a quiet moment with the group in the courtyard of our hotel in Beaune, hiking in Lauterbrunnen Switzerland, gondola ride in Venice with the music box to name a few." From the very start this tour was phenomenal! The places were beautiful, the activities were varied, and the depth of information was amazing. I have too many photos to go through! "Seeing Lauterbrunnen for the first time as we turned into the valley! We also really loved having one of the hotel rooms that faced Staubbach Falls. We left the balcony door open a little so we fell asleep and woke up to the sound of water falling. I would have been happy staying there for the rest of the trip!" It was great, better than we expected. We had gone on a previous tour with only five other couples and when I saw the size of the group, I was a little disappointed but it turned out to be a very wonderful experience. Everyone was awesome and the group clicked very well. The towns we visited were amazing but the most important aspect about each experience is that our tour guide, Reid gave us a thorough background of what we were about to visit, including its history, customs and etiquette. "Our visit to Lauterbrunnen, Switzerland. Everything about it was magical. Again, Reid made sure we know what to do in our spare time and was always available to counsel each one of us on anything we needed." Guide Reid made trip very special. He made quick changes for special values, like gondola group ride and fun dinners. Group also very close with much support and humor among group. Reid kept us always moving and on time so no lagging to slow group. Reid very updated on sites's history and local customs. Reid made trip special with his knowledge and humor to relax us. "Liked the scenery and friendly village and mountains in Swisserland; hiking short trails on mountain paths much fun. Venice rain storm after dinner exciting with flooded streets." I thought that the bus travel would be lost time as well as tedious. The opposite turned out to be true. First of all the vehicle was new, spacious, clean and comfortable. The windows provided an unobstructed view of the spectacular landscapes as we traveled from place to place. And while traveling our guide spoke with intelligence and insight upon the history of each of our destinations and tour sites. We stopped frequently so there was no discomfort during travel. Autogrill Rocks! "Walking through the tunnel and out onto the ground floor of the Coliseum in Rome and also the climb up into the falls in Switzerland." Absolutely the best experience for a traveler new to Europe. Our tour guide, Reid made it so easy to enjoy the sites, history and culture of each country helping us get more involved with the locals. I really enjoyed the group interaction and it quickly became a favorite part of each day. We all shared laughs and experiences from the day and became closer as we traveled. "Rome was my favorite city that we toured and has to be my favorite WOW for history. The town has so many layers of history as our guide. Lautterbrunnen was totally awesome and my personal WOW for beauty!" First, Reid was an outstanding guide, and his prepping us for each new tour stip was a fantastic addition to the experience. He was a font of knowledge not only on the cultures and differences we would be interacting with, but also with his insights into history, art, and religion and how the various sites were exemplars of the sweep of history in Europe. Second, the "back door" approach to Europe was just what we looking for, The hotels we visited were charming. and the staff were friendly. "Lots ow "wow" moments on this tour, so it's hard to rank them. Venus de Mile and St. John the Baptist at the Louvre, the courtyard speech at the Hotel des Ramparts in Bohne, the moment we disembarked in Lauterbrunnen, having a beer with a civil servant in Munich at the victulmarket, the gondola ride in Venice, the four horses in St. Marks. David in florence, but also Dawn and Dusk in the deMedici tomb, and the Colloseum and the Forum." We enjoyed an excellent trip, covering everything we'd hoped, and more efficiently than if we had tried to do it all on our own. Our guide was the best. "Trümmelbach Falls, Switzerland and the gondola ride in Venice." Absolutely Fabulous! Tina our guide and John our driver all through our trip made us feel as we one big happy family. Tina's wealth of European culture was exceptional. Inspired me to learn more and of course travel. Highly recommend Rick Steve's tour. "Many 'wow' moments. The little town of Beaune easy to walk around, visit historic sites and site outside at a café. Another in the running worth mentioning was when we visited FICO (Italian food market). This is a tour in itself. Totally worth going." Great. All as expected and anticipated and more. I caught a bad cold around 4th day of trip so it made me a little more self-conscious around other folks on the tour. Tried not to cough,etc., around them too much, so a little less enjoyable than it would have been for me. That had nothing to do with the tour though. Just glad i didn't have a roommate. Oh, well. "Really enjoyed my "extra" day in Paris, as I was never sure I would be able to return. Of course, Switzerland is always lovely. Scene outside hotel window was gorgeous. Loved the tour of the cave and the waterfall. Even the walk back to town. Pretty great entering the colosseum in Rome on the ground level. Just anticipating the bus ride when we were ready to go somewhere new was cool. So comfy and enjoyable." The tour ran like a watch. How they can drive and give each daily tour and come in at days end was fantastic. Tina was a guide with real passion in everything she did. Very knowledgeable and fun to listen to her. John our bus driver drives that bus like a smart car. Great to talk to. Smooth ride! "Swiss Alps! Could have spent alot more time there." I had a great time on this tour. It was a wonderful experience. Everything was set up to allow us to have expert guides and free time to explore. I traveled with my sister and this was the first time to Europe. I'm very happy that we tried Rick Steves tours. "Like I said we've never been to Europe so there were quite a few WOW moments. I'm a tech and builder type, so I was really wowed by the Buildings and Sculptures. And the size/amount of the Museums were incredible." A lot of 'firsts' for me. First ever tour, first R S Tour and first solo vacation! This was one of the best trips I've taken, it exceeded my expectations. Tina our guide and 'Big John' our driver were outstanding. Group dinners were very good, and being a vegetarian wasn't a problem, I'm still trying to shed the extra pounds I gained! I loved my fellow travelers, we had so many laughs and good times together, 7 of us were solo and the rest couples. Nice hotels and great local tours & guides. "I had too many 'Wow' moments to name just one! Switzerland was definitely a big wow, standing on my balcony looking at the Alps and waterfalls was amazing. I've wanted to go to Italy for a long time and Venice blew me away, it's so unique and beautiful, then there was Rome....pictures do not do the Colosseum justice, wow, it is huge and breathtaking! My whole trip was one big wow!" Great tour guide Tina. Very experienced. And the bus driver John certainly took us safely and happily through the European countryside. I can't wait to do another tour. "Though it is hard to find a single "wow" moment, I really loved the inn at Beaune. The owner was delightful, and I particularly loved the old room at the top of the inn." The tour was very well organized. Our guide taught us about the people's history and customs so that we could gain the most from our experience. Travel arrangements were comfortable and I really liked that we visited a busy city then spent a day in a slower paced area. Had I been there without a guide I would not have felt comfortable to perticipate as much as I did. I think this was a great way for a first time visitor to tour Europe. "There were many but I really liked the Swiss village of Lautterbrunan. Waterfalls, caves and snow covered mountains surrounded us. We also enjoyed music from two gentlemen in the church that was very nice." It exceeded my expectations, I loved the tours mixed with personal time and group time. Everyone was so knowledgeable. "The amazing churches. The peacefulness of the Swiss Alps." except for the lousy weather in Paris (fortunately we had been there only a few years before) everything was great. Tina was a wonderful and informative guide, the local guides we picked up were spot on, hotel accommodations were conveniently located and as good as any we've used in the past, group food events were well chosen and very tasty and local, and our driver Big John was an added bonus. "I little unusual for all we saw and did, but our hotel in Munich was literally next door to the Jewish synagogue so on Saturday morning when others had a tour of the city, I attended services (a Bar Mitzvah no less). For a Jew to celebrate a Bar Mitzvah in Germany was beyond extraordinary! The Colosseum in Rome and our private, group entrance was a biggy for me!" I had a fabulous time. Everything went well. We had some bad weather in the Swiss Alps but that didn't deter us from having a great day. We'll just have to return! "Seeing the Swiss Alps. We had many more but this one was a lifetime dream." The tour was well organized and balanced in the amount of planned activities and free time. Tina was excellent at orienting you to each location and suggesting activities for your free time. "Gondola ride in Venice where our guide has arranged an opera singer to be on our boat since we were celebrating our 20th wedding anniversary. A close second was in Switzerland when we opened the curtains in our room and there was a waterfall in full view." The tour was a perfect mixture of planned activities and time to explore on our own. Our guide, Tina, was phenomenal and I looked forward to listening to her and learning about the food, culture and facts about the places we visited. This tour also has a great mixture of visiting large cities and then visiting quieter smaller cities. It was wonderful having special entry into many of the museum's and sites, thus avoiding the long lines. "There were many "wow" moments but seeing the majestic Swiss Alps was more than I expected." A great trip that covered a lot of Europe. Our guide Tina, made the trip better because she was full of knowledge and had a great personality too. From time to time a little too much "museum walking and standing". A few days had too much squeezed in, like Paris with Saint Chapelle--Notre Dame--annnnd the Louvre, too rushed. You need more time to explore Paris.A few more "country" stops would have been nice,i.e. parks. Bus ride was pleasant and Big John was a great driver and very cool dude. "Staying with Italian family at their Tuscan farm house." 14 days in Europe has in fact changed my outlook on the world, I have seen the differences in life styles and it has changed my life. I went with no expectations, I went to fulfill my wife's dreams but what I received was a desire to travel, to return again and again but now with the travel skills, confidence and experience to go, to explore, to jump on the Paris metro, to take the Venice water taxi and well try to return, to travel outside my comfort zone and say hey it's great. "Day 5 Lauterbrunnen Valley, I didn't know what we expected as we climbed the four or was it five stair cases to room 41 of Hotel Oberland But opening and stepping out on the small balcony I knew this would be the place, Staubbach falls to the right, the sound echoing across the valley of Wegen train climbing up from the valley, and some were under the clouds ahead Eiger and Monch waited till tomorrow." "Switzerland or how crowded Florence has become." The tour was about what I expected, which is why we signed up with Rick Steves. More like an educational experience than a vacation, although there were plenty of relaxing moments sipping wine and enjoying the view (there was always a view) and the wonderful spring weather. Excellent choices for an overview of Europe. Good pacing (busy city one stop, something more rural and quiet the next). "Roman Colosseum and Forum. I have a background in history, Rennaisance and Reformation, and Church History. Franchesca offered a very fresh approach with integrating the Roman Empire with subsequent European History by subtly suggesting the Church merely stepped into the shoes of the Empire once it fell, in many ways. That was a real "aha" moment for me, and I'm surprised I didn't see if before...maybe I've been just too influenced by American church/state separation." What an amazing experience to have been a part of. I absolutely loved everything thing about this tour. From the moment we hit the streets of Paris until we hugged goodbye at our fabulous farewell dinner I was not disappointed. Every detail of this trip was setting us up for success in navigating and experiencing Europe. "There were way too many "WOW" moments to count! However, if i had to narrow it down it would hands down be our stop in the Lauterbrunnen Valley. I have never felt more at piece as I did walking though the Swiss Alps. The mountains were so majestic and everything from the sleepy little buildings to the roaming cows were just so serene." Prior to this Best of Europe in 14 days tour, I had been on two others with your company--each one has been phenomenal and leaves me wanting more. The first two times I traveled solo, but for Best of Europe my best friend went with me as she has never been to Europe and I was so excited for her to experience it. Well, she was beyond thrilled, as was I. We couldn't have had a better guide in Martin. "There were so so many "wow" moments. Sitting in a cafe in Paris when the bells of the church we were right next to were chiming.. the stunning view from our room in the Swiss Alps, passing castles as we drove through the italian countryside, our Tuscan retreat, the colosseum and the roman forum--just amazing." 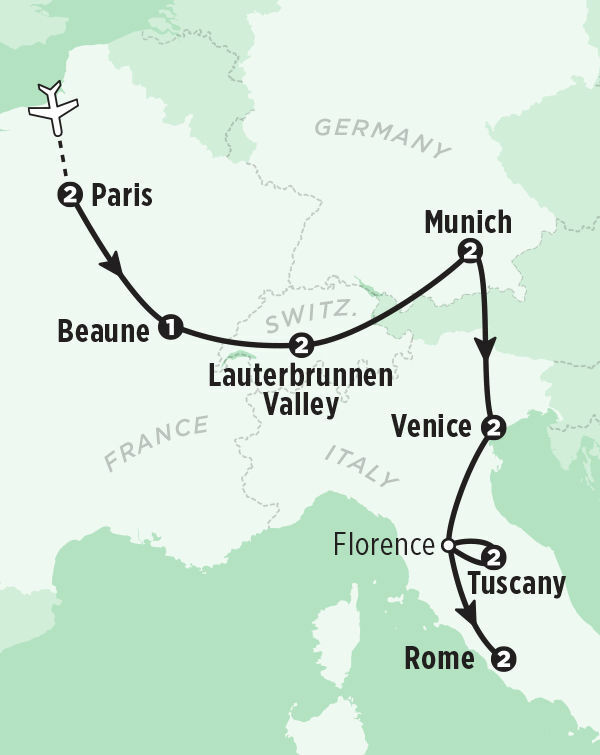 This was the greatest of tours, our third Rick Steves, a whirlwind of activities traveling through France, Switzerland, Germany and then for the finale Italy. Oh yes we also rode through a small part of Austria. This diverse group gathered as strangers but by the end of the tour became like a family, each one looking out with care and concern for the others. Our fearless leader Martin introduced us to all aspects of European life with a zest that was contagious. We wanted to see it all! "The favorite "wow" moment for me was the spectacular Alps! They were magnificent with their giant rugged peaks covered with snow. The weather was beautiful, the hiking not too strenuous, and the views only something you would see in a movie. The cows with their bells ringing as they walked in the pasture just added to the idyllic picture book scene. WOW!" We had an amazing time and loved out trip. Our guide was awesome, personable and helpful. The others on the tour were very laid back and fun to be with. We loved the "surprises" such as ice man and a cemetery tour. 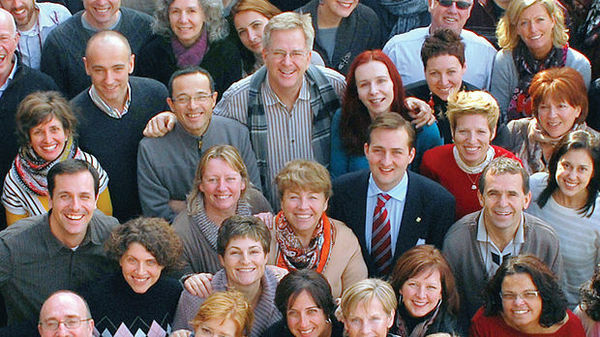 We would definitely go on another Rick Steves tour! We had both been to Europe before, but that was a long time ago and this was a great tour! "Getting to see Venice for the first time and getting to the top of the Schlithorn early in the morning while it was still quiet and empty. Then the walk down was awesome too!" Martin! What can I say? Spectacular! "When heaven came alive in Venice." Our Rick Steve's tour included visits to France, Switzerland, Germany and Italy. During the 16 days of our tour, we visted far more places than I anticipated which gave me a glimpse of each area, their customs, cuisine and ways of life. The trip was planned well to insure we were able to visit the most places in the time we had. "My favorite "wow" moment actually occurred in Beaune, Switzerland. "Hospice de Beaune" was fascinating and my most memorable "wow" moment. The self-guided tour of the beautiful building explained in great detail the lengths that were taken to care for the critically ill and dying. The beauty of the facility and the watchcare of the nursing staff must have encouraged the patients years ago as they were cared for so well. The kitchen, the chapel, the pharmacy, the patient beds were well preserved." Fulfilled objective of learning how to get around and where I want to get back to in major places I always wanted to visit. "Seeing and hearing an avalanche on the Eiger while peacefully sitting at a scenic overlook on a solitary hike to Murren. Also listening to a Vivaldi opera one evening in a church off St Mark's Square in Venice." My first trip to Europe exceeded all my expectations thanks to the Rick Steves experience! I expected to see beautiful churches, iconic art work and historical places and sites on this 14-day Best of Europe tour. However, we experienced so much more than just buildings and artwork by being a part of this incredible tour group. I feel like I gained new perspectives on life, I met wonderful people along the way and truly grew as a person and citizen of the world. "There are way too many "wow" moments for me to pick just one. If I really had to choose --- I would say the walking tour of the Colosseum and Forum with Francesca in Rome on our last day together. Her very passionate, heart-felt and emotional presentation about the difference between being just a "tourist" and being a "world traveler" brought many of us to tears and was such a perfect closing to an amazing 2 weeks." Overall, the tour was wonderful. I wish there had been a little more time to explore on our own, but I understand trying to pack in all the sites. It was exactly what it's called...a taste of Europe. It really has inspired me to go back to the cities I most want to visit again. This time, I will discover the under belly and talk more with the locals. Sometimes when traveling in a group it can feel a little less of a real experience. I will definitely revisit most of these places I hope! "The Alps and countryside in Switzerland were breathtaking. I think I could spend weeks hiking the Alps! The waterfall we visited was scary and powerful. The cows roaming the countryside were charming. The cheese was so good. The nights in Venice were full of music and magic. Especially the orchestras in the piazza. Very romantic and magical. The small towns like Beaune were full of amazing pastry shops! Best cream puff I ever had." This experience was better than I expected. The group of 28 were easy to travel with, there was a mix of ages (30-80) and singles versus couples. The logistics went very smoothly. I especially appreciated the special presentations (the lunch at the vineyard, fondue demo, mask making, night time gondola ride with Italian singer). Also the local guides were invaluable. "I loved the mask making in Venice since I recently worked with paper mache. I could appreciate the artisans expertise. Plus it was a chance to see an actual resident in action." I had high expectations, and it well surpassed them. Between Dave, our co-tour members and all the guides and locals we met along the way- I wouldn't do it any differently. "Switzerland as a whole, and touring the Colosseum/ Forum with our amazing guide." It was an incredible trip that was well-organized and FUN! The tour completely exceeded any expectations we had. It was a great way to do Europe for the first time, and made us very comfortable with traveling abroad. "The Swiss Alps were indescribable. Every few steps we would come across an even more beautiful view." Our overall experience was great! This was our first time to the continent. We loved seeing so much, particularly the art in Paris and the history of Rome. A highlight for us was a Gondola ride in Venice,complete with music! I liked seeing life in Europe. Our guide,Dave is the best. He kept the tour interesting, was very organized, and did a good job keeping the tour on track. We learned so much from him, as well as from the local guides. "In addition to the Gondola ride, I loved seeing the Impressionist paintings in the French museums, particularly Monet's Water Lilies at the Orangerie museum. Everything else came in a close second, particularly the tour of Rome." It was the first time my wife and I visited Europe and the trip was a good introduction. We enjoyed the fact that most of of the travel and hotel arrangements were made for us. It would be nice if Rick Steves could partner with a reputable travel agent to offer a few options for traveling to and from Europe. My wife and I found the schedule quite demanding both physically and mentally at times and skippped some of the guided excursions and the hike through the alps to venture out on our own. "Exiting the metro tunnel and coming face to face with the Coliseum in Rome. The gondola ride in the Swiss Alps was a close second." I enjoyed the balance of each day; tours/travel as a group and ample free time to explore on my on. "My favorite 'wow" moment was taking the cable car ride up onto the Swiss Alps and enjoying the view and hike." Overall experience was everything we hoped for. "There really were too many to pick just one." We had so much fun. However it was the adventure that really hit me. 40 years ago I backpacked through Europe with Eurail passes and I had an adventure with a girlfriend. That was the last time that I really had an adventure until this trip. It was fun getting lost - asking directions - finding our way - and really experiencing different cultures. The cities were not fun for us because of the amount of tourists. But it's a live and learn situation and we learned how to deal with it. Actually we loved every aspect of the trip. We absolutely enjoyed our overnight stops, the afternoon bus break stops were fun. Hotels were exactly what we like to use when we travel. Small, personal, but centered for ease of access. The tour exceeded every thing we had hoped for. "Lauterbrunnen was magical. That is a must return for me. One other stop that Jode did was the American WWII cemetery in Italy. I am retired military and have lost a lot of friends in Iraq and Afghanistan so know about loss of life overseas. The place was so peaceful and respectful for what our boys sacrificed for. I could feel the gratitude and respect. Brought tears to my eyes." Since it was our first trip to Europe, our goal was to experience as many countries as possible without being too "rushed." We spent a couple of days in London before joining the tour in Paris..Mission Accomplished! What a great combination of taking advantage of the group when using local guides, hotels etc., but also allowing everyone some discovery time on their own many afternoons and evenings. I would highly recommend this tour to anyone who is looking for a 14 day "taste" of Europe. "There were many! However if forced to choose, it would have to be when my wife and I witnessed the Horse mounted Republican Guards marching down the Champs-Elyees during our free afternoon in Paris. The Prime minister of Lebanon was visiting and we just happened to be in the right place at the right time to view the procession. Also, we were treated to an after dinner concert in Lauterbrunnen. I still get goosebumps when I think about Willie's Alphorn rendition of "Amazing Grace." Wow!" This was a trip of a lifetime! Everything went better than planned and it was my first trip outside of the US. I had always had some reservations and wanted to wait until I was totally prepared. This trip gave me the confidence to become a world traveler and a smart traveler. This was an investment that brought back greater returns. "Ancient Rome was the wow moment. I've always dreamed of being there. I've seen multiple photographs and films, but it did not prepare me for the real location. Our guide, Francesca, also helped to make it special by explaining how ancient Rome is not just Rome's history, but human history." This tour was everything I hoped it would be and more! A perfect amount of guided group time matched by just enough independent time. This group was small enough that we all bonded well and became a fun travel family. Each new city brought more awesome moments!! Jody, our tour guide was wonderful! Full of energy and fun...and very knowledgeable! Her stories on the bus rides were informative and entertaining. A perfect trip in every way! "There were so many Wow moments! The Alps had to be right at the top of my list....so breathtaking! Rome was more awesome than I expected...powerful!" My wife and I had high expectations of our trip. It was our honeymoon, our first trip to Europe, and our first ever Rick Steves' tour. In every way were our expectations exceeded. We had so many opportunities to enjoy romantic experiences in picturesque locales, take in the vibrant culture, and developed some new skills making us wiser travelers. And if that weren't enough having the company of Jody, Laurel, and the rest of our tour group felt more like travelling with family and friends. "Picking a "wow" moment out of a tour like this is near impossible. Seeing priceless works of art and architecture in Paris, taking in the natural beauty of the Alps, enjoying the culture of Munich's Oktoberfest, and walking the historic roads of Rome... it's too much to ask. But if we are forced to pick only one "wow" moment it would have to have been that first group dinner when it finally hit that my wife and I were about to embark on a great adventure with some incredible new friends." The tour is organized, that makes the overall experience wonderful. You don't have to think or worry because someone already knows whats in store. You only have to be there to live it!!! "I'd have to say the Swiss Alps get me every time! But when I think of WOW in another context I could relate that to Oktoberfest. That place was insane! Everyone needs to go at least once in their lifetime! It's CRAZY That's the reason I picked the dates I did, because I didn't want to miss it and I'm sure glad I didn't!!!" This was my first Rick Steves tour OMG what an adventure. The hotels had exactly what you really need small quaint hotels in convenient locations. This is an active tour you'll see so much in a short period of time. I'd call this trip A Taste of Europe. Every place we went we wanted another day or two. We kept says or darn we have to come back. No matter where we were our days were full of adventure returning tired every evening and with great stories. Had fun at every turn a Great trip. "WOW...Switzerland is the most beautiful place. I loved every second of it. WOW...The Venetian Islands like nothing I've every seen. WOW...The Roman ruins...the beauty...the history...the people WOW...Nerone Pizzeria in Rome...down the street from our hotel. The food outstanding the owner and her staff warm, welcoming. We ate there 3 times in 3 days. Rick...they need to be in your book." Great guide who enhanced the experience. This tour should be a requirement for first time visitors to Europe who wish to educate themselves about each country. "Switzerland was my "wow" moment. Had beautiful weather." This tour exceeded our expectations. It was action-packed, if you wanted it to be, adventurous, if you wanted it to be, informative and epic. The hotels are perfectly located close to sites, metro or just plan beautiful. There were numerous surprises like an unexpected musical performance in Switzerland, several cooking demonstrations, group hikes, and bonus bus stops. This was all thanks to our accommodating bus driver, Paul, and our genuinely caring tour guide, Keith. "I have seen Micheangelo's David before but this was a whole new experience. Our guide, Keith, did an amazing detailed history of "David" before we saw it. He built it up just perfectly so when you turned the corner and saw him in the distance, I was in awe. I observed every detail that he mentioned. It was truly a completely different experience than my first one. I also loved seeing the Pantheon in Rome during our night walking tour. It was so beautiful that it didn't even look real." I would say to travel Europe as a tourist the first time was to join a group tour. This Best of Europe in 14 days covered a lot of first rate destinations. The places and sites I've been wanting to see have been fulfilled. I was the only solo traveler in the group and I felt so safe. Our group had fun together and bonded as one big happy satisfied family. "The Alps- God's creation is just wonderful! There is a Creator indeed! I will never forget the Alps- it just blew me away! The Schilthorn summit view of the Elger, Monch, and Jungfrau in the distance was stunning. The hike our group did in the afternoon was incredible..getting closer and closer to those beautiful mountain peaks..Aaah the never ending vistas of the Alps --just spectacular! The cable car,gondola and train rides were all fun too!!! I will never forget this experience." Everything was just perfect. The tour guides at each location, the group meals, the knowledge that Keith shared, was simply outstanding. It added a whole other dimension to the tour. I knew this trip was going to be special when we started off with the night tour in Paris!! They time everything just perfectly so we see the Eiffel Tower glimmer or the Tour of St Marks when the golden glow starts filling the Church. These are all things I would have missed if not on this tour. "There were too many moments to mention- each stop was a wow moment. Truly the trip of a lifetime! But Oktoberfest with the group was an amazing experience and who can forget the top of the Alps??!!" What a wonderful tour. It exceeded all of our expectations! Keith was a fountain of information during the bus rides, at the hotels and during the walking tours. He also gave us helpful suggestions for our free time to see even more. The ratio to structured time to free time was perfect for us. We particularly enjoyed the small, privately owned hotels where we stayed and meeting the property owners. "The view of Horsetail Falls from our room in Lauterbrunen, Switzerland was awe inspiring. Perfectly timed arrivals at the Eiffel Tower in Paris to see the light show at night; the turning on of the lights at St. Mark's Basilica to illuminate the gold mosaics and the noon chiming of the clock tower on the Piazza San Marco; and the Glockenspiel display at noon in Munich." It could not have been any better. We had the best group possible and the very best guide ever!!! Keith was so knowledgeable and fun that we learned far more than we ever anticipated. The weather was beautiful, the tours we're we'll planned and the free time was just right. Group meals and the hotels we're delicious, fun and centrally located making for easy access to the spots of interest. I have not one single complaint about the tour. What a wonderful way to see Europe for the first time!! "Venice, the gondola ride, being serenaded by a guitar and tenor as we glided through the canals after dark. Getting lost was a treat too!" The trip was everything we thought it would be and more! Great guide, great group of people. Still can't believe how much we did in only 14 days! Whew! "Too many to choose just one! The gondola ride in Venice, Oktoberfest in Munich, Trevi Fountain at night, the tram ride in the Swiss Alps, Michelango's David... the list goes on and on. Not the most fun moment but one of the most important was touring the Dachau concentration camp." Overall our tour was very good!! From the tour guide and bus to all the food!! Tour guide was very educated in the areas we visited, food and transportation! We were always blown away by the beauty of the areas, cities and the history of Europe. If your looking for a good European vacation with most of the thinking and great ideas at your doorstep this is the way to go!!!! This was our first trip to Europe and have no regrets. "Rome Italy.. so much history and beauty. Italians are very nice folks, all were kind and patient and willing to help with the language barrier!" Overall the tour was amazing. We saw and learned about places I had only read about or seen on tv. In person, the places were more awesome that I could have ever imagined. The tour guides in the cities were excellent. The whole tour was well-planned with busy days and low-key days, with visiting major cities and small towns or villages. I was somewhat overwhelmed by how much we saw and how much we learned. "Seeing the Eiffel tower with twinkling lights at 9:00 pm." The tour was wonderful, group was delightful (and punctual) and guides were perfectly fantastic! "Switzerland and the mt. And then the walk down the mt...."
The tour was well planned and offered a good overview of that part of Europe. We enjoyed the group as a whole and have many good things to say about our guides. It is very enlightening to see the various rest room facilities. Kind of makes you appreciate what we have in America. I would recommend this trip to anyone - with one caution - make sure you are capable of doing a lot of walking on hard surfaces. "Our favorite experience was the "official" beer fest in Munich. The party lived up to all of the hype." Our guide was outstanding! We traveled to 5 countries. The trip was stress free the hotels were nice the meals were great and we had a good amount of free time which was nice. "Rome was really cool the architecture was amazing! People were friendly in Italy not as friendly in France. Switzerland was gorgeous!" I realize now that I am home and telling everyone about our trip 1)How much I am recommending a Rick Steves Tour 2)Praising the knowledge and comprehensive teaching of Jesse 3)We dreamed about our European vacation every night for about a week after we returned. I love the diversity of the places we visited: big cities, small towns, quaint country sides, and the Swiss Alps. We happened to be in Munich for Octoberfest and in the Alps when a farmer brought his cattle down from the Alps. "I loved the Impressionists in Paris. Some are mentioned above. We loved the "surprises" our guides had planned for us: Stopping by an American Cemetary in Italy; entering the Colosseum just like the gladiators did; stopping by the Eiffel Tower when it was lit up. It is an absolute pleasure to get an awesome surprise as an adult. Makes us feel like kids again." I went on the trip alone and was expecting to see the sights of Europe that I'd seen in photos. Instead I got an incredible understanding and feeling of where these people and structures came from. Our tour guide Jesse was so intelligent and knowledgeable and taught us so much. At the same time he was upbeat and fun and did a spectacular job of bringing the group together. I felt completely a part of the group who included me in free activities and conversations. We became family. Fantastic. "Standing in the Pantheon and realizing this beautiful structure was constructed almost 2000 years ago. The immense pillars and dome were awe inspiring. Also, stopping at a beautiful overlook in Switzerland and having our guide bring out a surprise beverage break to make it a spirited fun break outside from a long ride." "I have always been a history buff, so my moment came at the back windows of the Capitoline Museum where I could look out over the Roman Forum- I've dreamed my whole life of seeing that." This was our first travel to Europe, so we wanted to see the highlights and the sights that are well known. The Best of Europe in 14 days met all our expectations. The well organized trip was made even more special by our guide, Jesse, and a fun group of people to travel with. "There were so many "wow" moments it's hard to pick one. I guess if I have to pick one, it would be the Sistine Chapel and Michelangelo's ceiling painting of Christian history. Even though this was not a part of the tour, we appreciated the scheduled "free time" to add sights we wanted to experience. We use the Rick Steve's audio download as we viewed this amazing chapel. It was very helpful to explain what we were seeing." This is my 2nd time going on the Best of Europe in 14 Days Tour. I enjoyed it as much, if not more, than the first trip. Paris is amazing and having an excellent tour guide, Jesse, made all the difference. Skipping the lines for museum tours and having an awesome dinner in a local restaurant takes the stress and guess out of travel. The time in Munich during Octoberfest was so festive! I also loved being at the Tuscan farm. It was peaceful and relaxing. "My favorite "Wow" moment was watching the cows in floral headdress being paraded down the street in the Swiss Alps." The BOE tour exceeded my expectations! So many breathtaking events & memories that I'm still in awe. Every location provide memorable moments along with thoughtful learning. Leaving each location I found myself wanting more time to learn & explore. I also found the balance between group events and free time very well done, and gave us a chance to personalize our experience. "Every day had a wow moment! However a definite favorite would need to be sunrise in Venice! Our guide, Jesse, encouraged early risers & runners to go out to St Mark's Square & beyond to experience a beautiful sunrise & quiet city! The first morning was so wonderful that we went out again on our second morning, & we were rewarded with an even more spectacular sunrise! A peaceful & quiet city just starting to stir, with an amazing progression of vivid colors as our BOE adventure continued!" James Williams and I used his evaluation together. Mine is the same as his. We had a great time on our tour of Europe. We had never been to Europe before so this was the perfect tour to get our feet wet. We will definitely go back! We met some fun people, saw some amazing places and had a great guide, Jesse Blackwood. The itinerary was well thought out - a busy city with lots of sites for a couple of days and then a quieter location where we could relax a bit more. We would recommend a Rick Steves tour to our friends. "It's hard to say one "wow" moment - we really enjoyed it all. We did love hiking in the Alps - although we are from the Pacific Northwest and are surrounded by mountains, they aren't the same kind of mountains that you see in the Alps. We also loved Octoberfest in Munich, the flooding of San Marco's square in Venice and St. Peter's Basilica in Vatican City." Where to begin? We glided along the Grand Canal while being seranade to Volare. We ate roasted chicken with a bare hand while hoisting a stein of lager with the other. We strode thru the main portal of the roman colosseum like so many gladiators of yesteryear. We gazed into the eyes of Michelangelos' David and Da Vincis' Lisa. We completed an assault of the Lauberhorn summit in the Swiss Alps and mastered the subterranean Metro of Paris. Fron alphorn playing to wine tasting, we did it all! "As we sat at our Alps hotel restaurant patio awaiting dinner, we were interrupted by the clanging of bells out on the narrow road that meanders along the bottom of the steep canyon. A parade of decorated dairy cows presented itself, tended by school girls in bright checkered dresses and young boys in neat black jackets with red piping. The cows, with small trees decorated with flowers on their heads, were returning from the high meadows with all the reverence befitting the season!" Great tour guide. Loved the flow of the tour. Loved all the opprotunities to visit the local spots. Lots of information during our bus rides, always learning something new or unique about the cities we visited. I would love to do all the tours! "Enjoying a fresh cup of yogurt on the top of the Swiss Alps, as we walked pass the cows and goats. The views were breathtaking." I keep telling all of my friends that you certainly get so much value with a Rick Steves Tour. Everything was great, from the food, transportation, lodging, guides, lines, etc. There is not a moment where I felt like I wasn't getting what I expected, the majority of our tour greatly exceeded my expectations! "Notre Dame, of course, was just WOW! I have seen it so many times in media, but to be there in person was something else!" It was beyond my wildest dreams. I love the fact that my husband and I were just able to sit back and enjoy without having to have made all the reservations for each location. "It is impossible to pick just one, there were so many. An evening ride on a gondola in Venice, walking in the gardens at Versailles, and praying in front of the Pieta in Rome." This is my first time traveling Europe. The overall experience was educational and inlightning and completely overwhelming at times. I chose this tour because I wanted a taste of many countries to see where do I want to go again. To be honest that is going to be a hard task to decide where to go next. There was not one country that was not amazingly and interesting in its own way and all of the countries had unique and delicious food . "A particular wow moment is very hard to pinpoint but I think the Parthenon in Rome would be my wow moment. There were other beautiful places that were unique interesting, but it has been a place that I have wanted to see for a long time even saying that, there were so many places that wowed me." I thoroughly enjoyed every aspect of our trip. Well planed, great guide & bus, the hotels, guides, dinners. Could not have gone better. You have done an outstanding job and we will be going again. "Standing on the Rialto bridge over the grand canal in Venice." First time to take a Rick Steves tour. Overall enjoyed the experience. Fast paced energetic tour. I am in good shape but this tour wore me out. Maybe a little too fast paced for the average traveler. "I really enjoyed Rome the most. My most WOW moment was a visit to Pristine Sistine Vatican tour. Not included in the Rick Steves tour but worth the extra 90 Euro each to get entry before the large regular admission crowds. Recommend including Pristine Sistine in future tours." I enjoyed this tour most of the time. Even hectic schedule I could see good parts of 5 countries. I got s good idea of which country I would like to visit again. "Beautiful village in Switzerland and awesome culture of Italy." For a first time traveler to Europe this tour was perfect for touching on all the highlights of each country. It was a very fast paced tour and loved so much all of the tours led by locals made it very special. We learned how to get around the various cities using their transportation systems making us feel confidant that we could travel on our own. "I fell in love with Paris. Because it was our initial city to visit in Europe I was a little overwhelmed by the sites. Each place we went to was a Wow. When we arrived in the Swiss Alps and checked into our room our view of the valley floor was spectacular and almost surreal." Great introduction to Europe. I learned travel skills and saw many highlights of the areas we visited. The surprise was how much we enjoyed our tour group. We made many new friends. "Rome- standing on the terrace of the Capitoline Museum and viewing ancient Rome. Also, a third party early entrance tour of the Vatican museums, Sistine Chapel and St Peters Basilica." Had a fantastic experience. Perfect introduction to Europe. We had such a good time; we want to go visit most locations in more detail and travel out further into the countryside, particularly in France and Italy. A key component that made the tour exceptional was the guided tours of the various museums and cities. Our trip guide and the local guides are extremely interesting and very knowledgeable, putting context into the views and artwork. Definitely looking at other tours with Rick Steves. "Many "WOW" moments on this tour. But probably the most remarkable was viewing ancient Rome for the first time. Breathtaking and moving." Most tour members arrange to fly into Paris and out of Rome ("multicity" on flight-booking websites). Booking round-trip to one city will require a connecting flight, train trip, or additional overnight stay in Europe. We suggest arriving a day or two before your tour begins to allow ample time to get over jet lag and be well-rested for the first few days of your tour. For more information about transportation options for getting to and from your tour, see your Rick Steves Best of Europe guidebook.